– What are fire glass crystals? – What is reflective fire glass? – What is a fire pit glass? – Is fire glass flammable? But before that, I will give some quick information about what fire glass pebbles are. What are fire glass crystals? Fire glass crystals are composed of small bits of tempered glass that are used in fireplaces and fire pits. They are used as a replacement for outdated ceramic logs to give the homeowner, restaurant, or hotel a decorative flair. The fire and ice combination quickly became a fast-growing trend for homeowners and designers since its introduction in 2010. Since then, it has been much more common to see fire glass pebbles used in fire pits, tabletop fireplaces, and fireplaces. Restaurants and hotels are quite fond of fire glass pebbles because of their low maintenance attributes, as they hardly ever need cleaning or replacement. Fire glass pebbles like this serve two primary purposes – Functional and Aesthetics. 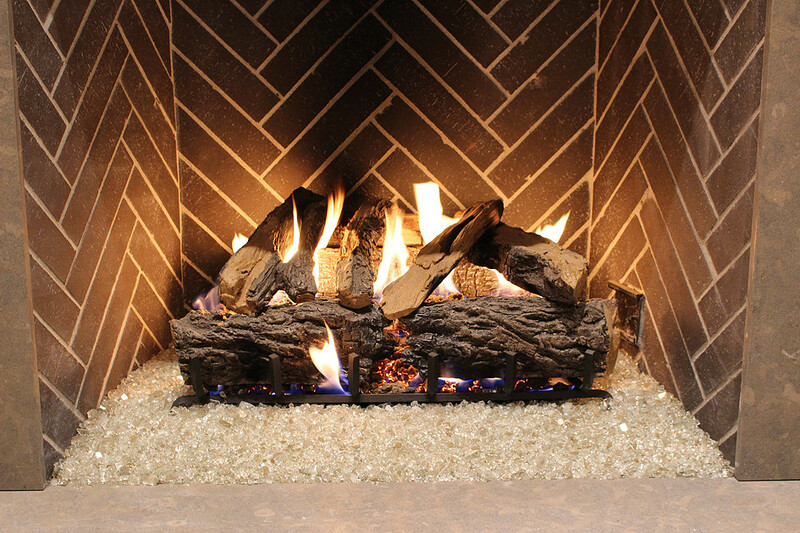 A Fire glass pebble quickly became a very popular alternative to ceramic gas logs. The logs can disrupt the ambiance because it is quite apparent that they are fake. Moreover, exposed natural gas or propane lines can create a weird visual that tend to block the natural movement of the flame. Fire glass became a popular alternative to fake ceramic gas logs that kill the natural ambiance of a dancing flame. Since everyone knows the logs are fake, why not fill the fire area with something beautiful? Since fire glass pebbles are translucent, they create an exceptional look when they glitter and shimmer under a clear night sky. The flames rise up around the fire glass pebbles in a specific way that create an aesthetically appealing setting that gives it the illusion that the fire glass pebbles are on fire. This wide range of colors will help set the tone that perfectly matches the interior design of your home, hotel or restaurant. You can browse our gallery here for some inspiration. How Does Fire Glass Work? Let us check How does Fire glass work? Fire glass pebbles are put through a special treatment that allows small pebbles to come in direct contact with hot flames without melting. Tempered glass is a type of safety glass that is commonly used for a variety of applications including windows, computer screens, and shower enclosures. A Fire glass pebble is a tempered glass that adds color and reflection to fire pits and fireplaces. It consists of small, stone-like pieces that are rolled and polished so that they aren’t sharp or dangerous. Fire glass pebbles are made out of recycled glass, making it a brilliant repurposed product that is original and authentic. Since it is tempered, fire glass pebbles don’t melt, soot, or explode. It’s safe to use and does not emit any harmful byproducts into the air. Fire glass pebbles usually comes in the shape of small pebbles or in the form of crystals. 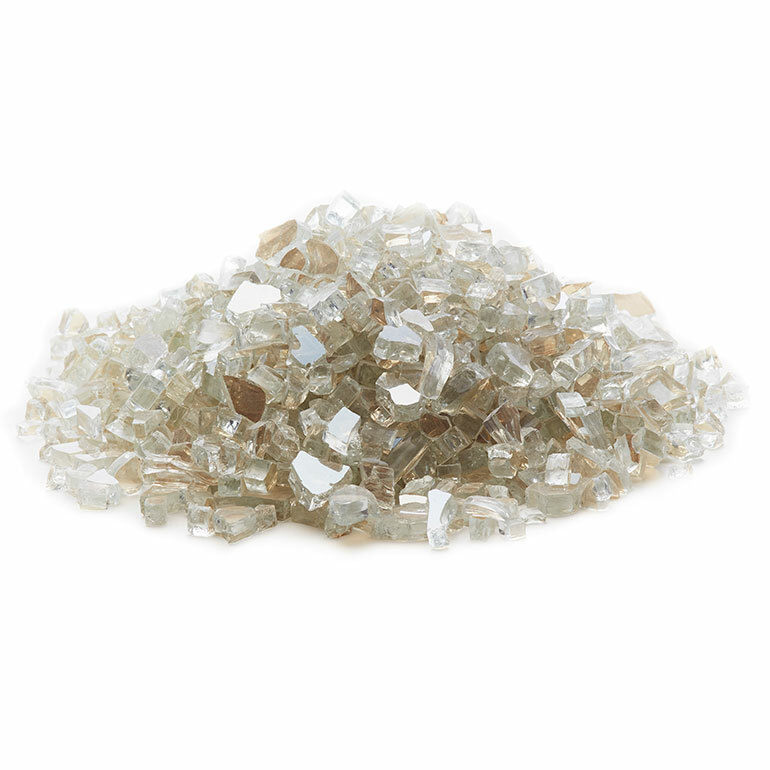 Fire glass crystals are made to simulate the look of diamonds and other special cut stones. They are essentially the same thing, merely represented in a different shape. What fire glass pebble colors are good for what locations? Color is an important visual in our lives. A fire feature like one of our fireplaces or fire pits works well, in that the glass itself can be used as the complementary color in your design. A delicate balance must be met between the compliment and the dominant colors. The compliment can only touch on eye-focal points and not dominate the overall design. Think of an all-white room, if we were to compliment the white with black fire glass pebbles in our fireplace, the fireplace becomes a focal point and center of the room simply by our eye being drawn to the contrast in color. More advanced color schemes usually complicate home design as simplicity and clean function are the latest trends designers are following. Think of the colors already utilized in your home. What is the paint color used on the walls? Picture frames? Does your existing fireplace use warm or cool colored stones? All of these are important factors when buying the right colored Fire Glass pebbles for your needs. Warm colors are those that “feel,” warm such as red, orange, and yellow. Cool colors are those that “feel,” cool like blue, purple, and green. Neutral tones such as black, white, and grey have no temperature identity of their own unless coupled with another color; then these neutrals take on the identity of their compliment. This all happens in the eye. Because the eye is constantly fighting against an overabundance of stimulation, it has to identify what is most important to focus on. Lowe’s is an online store from where you can buy Fire Glass in many different colors. As you all know everything is now online. You don’t need to go to the store on such chilly days. You can simply just open your laptop visit Lowe’s and order Fire Glass in whichever color you want. And then simply enjoy the cold days with warm Fire Glass. Not only this Lowe’s gives you wide range of products which includes- Christmas Decors, Gift cards, Electrical appliances, flooring, Heating and cooking and much more. Amazon is yet another best online place from where you can buy Glass fires in variable colors. Amazon is a lot like your neighborhood Walmart store. They feature a great selection of high-quality merchandise, friendly service and, of course, every day at Low Prices. Amazon eCommerce combines the small structure and nimble nature of a startup with the resources of the world’s largest retailer. You can browse our entire fire glass products line here. What is Reflective Fire Glass Pebbles? There are many different sizes, colors, and types of fire glass pebbles that we have and the one that will be perfect for your decor. Fire glass is heat tempered glass that is processed through a tumbler to prevent rough or cutting edges. It will not melt, degrade or emit toxic fumes and will last a lifetime! Some types of fire glass pebbles are, made from recycled post-consumer glass bottles, window scraps, and furnace cleanouts. In the following paragraph, we will discuss reflective fire glass, along with other types of fire glass pebbles. If you are looking for an even more dynamic flame display then reflective fire glass could fit your needs. Reflective fire glass amplifies the intensity of the fire by reflecting the light of the flames. During the day the glass continues to shine as it catches the light of the sun. Reflective fire glass is made from the same color infused tempered glass as our accent fire glass pebbles. However, reflective fire glass has been vigorously polished to give it a mirror-like finish. It will not melt, degrade, emit toxic fumes and does not create soot, ash or smoke. Original fire glass pebbles and reflective fire glass offer several different looks or “finishes” to choose from. Here’s what they are and what to expect from them. Tempered Reflective fire glass is sometimes offered with a semi-reflective finish. A Glass that is non-reflective will retain more of its true color while your fire pit is lit, rather than reflecting the light. There is no limit to the ways you can combine and blend different types of fire glass pebbles, but we do have a few favorite options. Original fire glass for a combination that both shows off the color of the glass and lets the firelight play on its surfaces. This gives you the best of both worlds if you value both color and light effects. Mix multiple colors to create your own unique palette. I generally recommend 2-3 colors to create a nice balance. A popular new option is to blend lava rocks with fire glass pebbles for an exotic look. The rustic natural stone is a perfect backdrop for the brilliance of fire glass. The Reflective Collection from Exotic Pebbles is basically the same as the Classic Collection, but with an added twist. It is manufactured to the same high specification as the Classic Collection and from the same materials. But during the manufacturing process, one surface of the Fire Glass Pebble is mirrored. On your fireplace or fire pit, this mirrored surface amplifies the reflections of the flames and colors creating an almost “kaleidoscopic” effect of color and light. The Reflective range is available in the same 13 stunning colors as the Classic Collection. Which includes Black, Copper, Crystal, Tahitian Teal, Bronze, Cobalt Blue, Sky Blue, and Gold. Sky blue Reflective Reflective Fire Glass is ideal for all propane or natural gas fire applications.This fire glass pebble is richly colored to appeal in indoor and outdoor venues and is tempered to withstand the most extreme temperatures of fireplaces and fire pits. These glass pieces are created through an industry-leading manufacturing process to ensure each piece will maintain form and vibrant color. The glass is complemented by a bag designed for easy handling to apply and store. Use medium size glass for fire pits with hardware requiring larger glass pieces. Feature reflective tempered glass in fireplaces and fire pits to impress all with its durability, charm, and decor. This black reflective fire glass pebble from Fire Sense. Choose any of the four beautiful color schemes to compliment your fire pit and surrounding décor. The elegant colors will turn your fire pit into a true work of art while the reflective design will produce mesmerizing flames and a stimulating viewing experience. Fire glass pebbles are easy to install and mess-free. The high-quality tempered glass is heat and fade resistant and will last for years to come. 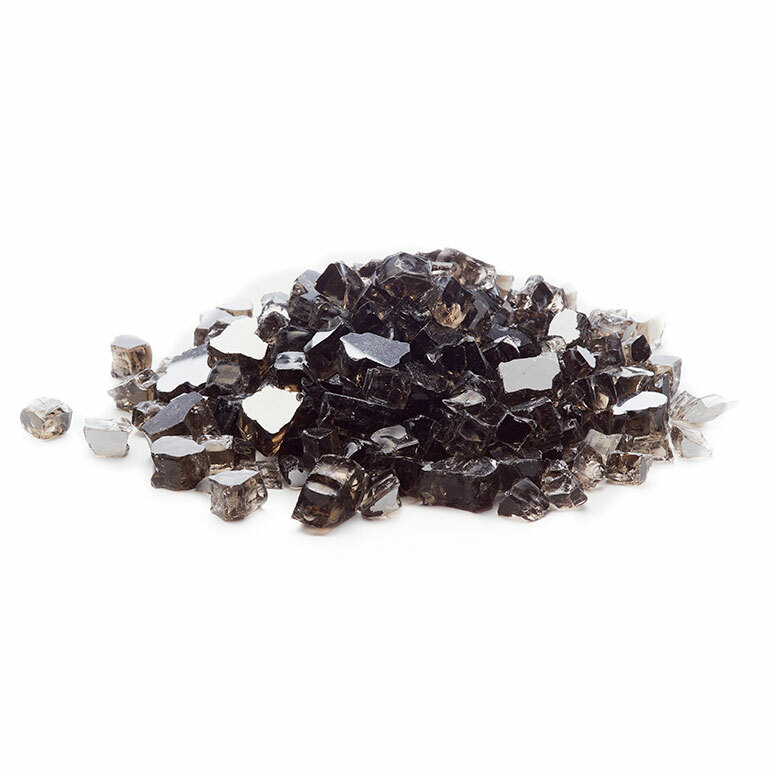 Jazz up your outdoor living space with Black reflective fire glass pebbles. This reflective fire glass will add an extra burst of color compared to our regular fire glass pebbles. This glass is recommended to be added on top of the regular glass to create a dynamic look at a lower price. Mix and match colors to create your own design and add your personal flair to your outdoor decor or indoor fireplace. This fire glass pebble is made of the highest quality of glass. It is created by melting color-infused, non-tempered glass into large bricks and then non-uniform pieces are chipped off using a grinder. Those pieces are then tumbled to remove the sharp edges making them safe to touch. This glass will not melt, degrade or emit toxic fumes. Our accent glass comes in a variety of colors for you to accent your fire with! This amazing reflective fire glass resembles flattened marbles or jelly beans. This fire glass pebble is made of smaller and irregularly sized tempered glass pieces. 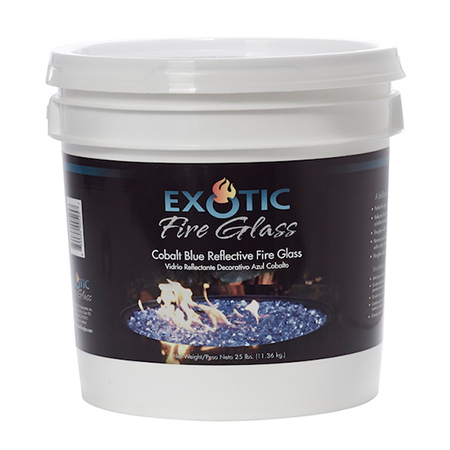 Cobalt blue reflective fire glass is color infused and has a fairly translucent finish to them. Smooth fire glass creates a less porous surface than even our 1/4″ fire glass pebbles. This means that the flames will flow under and around the openings in the fire glass, creating an even greater look of liquid fire. Smooth fire glass pebbles will not melt, degrade or emit toxic fumes. Nor will it create soot, ash or smoke. These color offer a modern twist on nature; these balls, shapes, and stones are an artistic alternative to ordinary ceramic logs. Whether you choose geometric shapes or natural looking stones, you are sure to turn your fireplace into a piece of art! These fireplace alternatives are made from high-heat resistant ceramic and come in many different sizes and colors. They work great by themselves or can be placed on a bed of fire glass pebbles to create an entirely new look. These amazing Crystal reflective fire glass pebbles comes in amazing colors and attractive crystal form.This looks good at homes or hotels.It enhances your home beauty. Perfect for any natural gas or propane fire pit or fireplace applications. Dazzling mirror finish on one side creates a brilliant yet elegant look in any application. Tahitian Teal reflective is Perfect for any natural gas or propane fire pit or fireplace applications. Dazzling mirror finish on one side creates a brilliant yet elegant look in any application. Remove your dirty and aging gas logs, wood or lava rock with a unique modern look. For some homeowners, a black fire glass pebble is just too dark a shade for their surroundings, whereas copper or gold is too light. If your customers are facing this problem, then bronze reflective fire glass may be just what they’re looking for. Bronze is a perfect mid-range hue with a natural shade that looks very stylish, yet blends well with many color schemes. A fire glass pebble can be used both outdoors and indoors with natural gas or propane fire pits. The amount of fire glass you need depends on the diameter of the fireplace, and even the depth of fill you would prefer. 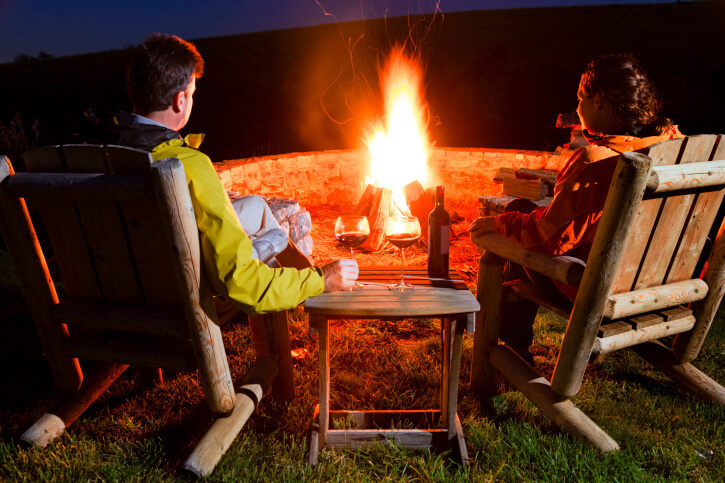 A fire pit is a great way to spend a summer night outdoors or keep warm when the weather gets chilly. Using and maintaining a fire pit is easy as long as you exercise proper safety and caution. Always position a fire pit away from any flammable objects and properly extinguish your fire when you’re done enjoying your pit. 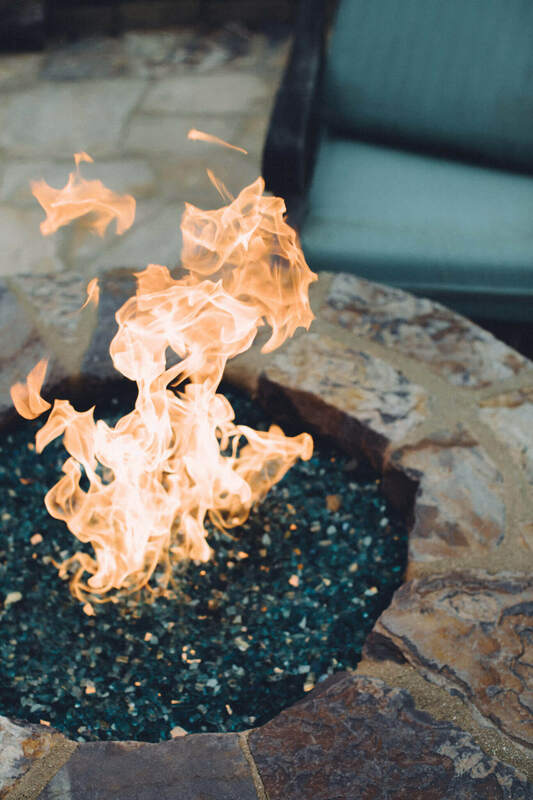 Fire glass pebbles, fire pits, and fireplaces have sizzled this year as one of the top additions to many restaurants, hotels, commercial offices and residential homes. Imagine sitting by the fire on a beautiful evening with your family and friends, taking in the marvelous sunset during the golden hour, or under the stars on a full moon with your favorite beverage. It is also important to determine the basic volume of this space while calculating the number of pounds of fire glass pebbles needed to fill your fire pit. Fire glass can be the perfect addition to your home. It is not only aesthetically appealing but also makes the space more functional. To determine how much is needed, use our Coverage Calculator on our website to calculate exactly how much you need! There are benefits to business which only a fire glass pebble fire pit can produce. Real estate agents and commercial developers/renters love the value a simple fire pit feature can add to the property’s value. When they sell such a property, such structures can result in a surprising sum of money. However, hotel owners, office managers, and homeowners do not necessarily wish to sell their properties. If we take that as our working hypothesis, let us see what benefits are received by these specific property owners if they install fire pits. Many homeowners and interior designers have recently discovered the beauty of fire glass. Gorgeous in both indoor and outdoor fire pits and fireplaces, a fire glass pebble has an effect all its own. There are a variety of methods used to make the different shapes of fire glass. However, all types of fire glass go through a process called tempering. How are fire glass pebbles made? It is made by shattering a large, flat piece of tempered glass. Like other safety glass, it will naturally break into tiny pieces that are all of a similar size. Reflective Fire Glass is literally that – crushed and allowed to break apart naturally. As a result, you’ll see some attractively organic curves and lines. This amazing Fire Glass will not melt, degrade or produce toxic fumes. Glass size -1/2 ” or 12-20 mm. 0.125 cubic foot bags, coverage area .47 sq. ft. This fire glass comes with a Rectangular fireplace. These Fire Glass Made from natural resources. Comes in a variety of Sizes, is Black in color, has a porous surface.For use with fire bowls, fire pits, and fireplaces, either indoors or outdoors (liquid propane or natural gas). This lava can withstand extreme temperatures. Requires very little maintenance. Turquoise is a friendly color. When you wear turquoise, people automatically perceive you as being easy going and approachable. When turquoise is used as the dominant color in a room, it fills the environment with feelings of ease and comfort. It might be a good color to use when decorating for a friendly get together and the perfect finishing touch for such a gathering would be our Turquoise Medium Fire pit glass. This Fire Glass is good for outdoor landscapes and fire features. Tumbled for smooth edges. 100% tempered fire glass to withstand extreme temperatures. This Fire Glass is ideal for landscapes and for use in propane and natural gas fire applications. All glass pieces are tumbled to produce smooth edges for landscaping while also tempered to withstand high temperatures. These glass pieces are created through an industry – leading manufacturing process to ensure each piece will maintain form and color for years to highlight all indoor and outdoor environments. There is no color that makes an impact quite like red. Red conveys daring and ambition, and people who love red often enjoy being the center of attention. When you really want to make an impression on an audience, you must not forget to include the color red in your presentation, and if your customers want to really impress their visitors, nothing will do the trick like our red fire glass. There are other types Fire Glass. Each of these fire glass styles are distinct and are made in a slightly different way. However, they have all been tempered to make them safe to use in a fire. Whichever one you choose is completely up to you! Pick one that appeals to you or that matches your décor, and enjoy your fire glass! Exotic fire glass pebbles from Exotic Pebbles and Glass can turn any setting into a beautiful display of design and style. They are perfect for your home, hotel or workplace that gives just the right amount of decorative flair. For some great inspirational design ideas, check out our gallery. Various sizes, shapes, and colors are available to match any décor and to suit any taste. There is nothing better than sitting by the fire on a chilly fall night. A fire pit is a great place to gather family and friends for a simple get-together. No one will complain about what the fire pit looks like, as long as there’s more to eat. Even though all fire pits are welcoming, a sand fire pit steps up your backyard gatherings to the next level. A sand fire pit looks much cleaner than a regular pit. It gives off a feeling of luxury and family and friends will love sitting by the fire. They may even ask how much it cost to hire someone to make it. Good news! A sand fire pit can easily be made without the help of a professional. There are eight steps to making your backyard an oasis. While these steps are easy to follow they can be time-consuming. Read through the steps before starting the project to ensure there is enough time to complete every step. If there are a few willing friends or family members be sure to ask them to help. This can greatly cut down on the time needed to complete the project. Not to mention reduce the heavy lifting for a single person. The best time to plan a fire pit is when it would be used. Many people choose to have a fire towards the end of the day. It is easy to get the fire prepared in the daylight right before dusk and then enjoy the fire through the night. Take a quick stroll around the yard at dusk to find the perfect spot for the fire pit. There needs to be plenty of room to make a sand fire pit work. At least sixteen feet and up to twenty feet depending on the size of the pit and the number of chairs desired. The area should be far away from anything that could catch on fire. Think about bushes, any branches that are hanging, and even equipment like a swing set. Try to keep these items as far away as possible to avoid any mishaps. Make sure the fire pit is accessible for a hose. If the fire ever got out of control it is best to be able to quickly get to a water source to put it out. Plus it is just easier to put out at the end of the night when everyone is tired and would like to go home. Another thought is storage. Where will the chairs be put? Will they stay outside or go into a shed? Think about where the firewood can be stacked to be close to the fire pit. The most important items to purchase is a wheelbarrow. There is a lot of gravel, stone, and sand to move around. Moving that by hand is a sure way to be sore the next day. The easiest way to get gravel is to make sure the driveway is clear. This is an ideal space for the company to put the gravel so it can be transported to where the fire pit will be. Using crush and run gray stone that is 3/8” is best. Depending on preference this should cover anywhere between two to four inches. Getting a full load will ensure there is enough gravel for the whole project. This is about eighteen tons of gravel which can cover 500 square feet of space. For the fire ring, two different sizes of stone will be needed. Any landscaping store will have landscaping stones that work perfectly for fire pits. Purchase large stones that vary from sixteen inches to twenty inches. Smaller stones are also needed that are eight inches to twelve inches. The larger stones will be used for the fire ring while the smaller stones are on the perimeter. Depending on how large the fire pit is will determine how many stones are needed. These stones can take up a lot of space and are very heavy. Ask the landscape store to deliver them to the home, most will do so free of charge. With this large of a quantity of stone being delivered, they will come packaged in pallets. Mortar cement and sand will be needed as well. This can be found at any hardware or home improvement store. There is a choice between different sand colors, depending on what the fire pit will look like. For a more beach-like fire pit choose a silica sand. This is the light, white sand that many people expect by the ocean. A cheaper alternative is playground sand which is a much more common light brown color. There are a few simple tools needed to complete the project. They are ones that can usually be found in a garage at any given time. Find a shovel, screwdriver or wooden stake, access to water, a ten-foot nylon string, and hard tine rakes. If these tools are not handy they can be picked up at any hardware store. Make a list before leaving home so all materials can be collected in one trip. Start by making the center of the fire ring. Do this by driving a stake into the middle of where the fire ring should be. Tie a nylon string to this stake. Measure the diameter of the ring and mark this on the string. Use the string to walk around the diameter of where the pit will be to indicate where the edge will be. Once the outside of the pit is marked dump all of the gravel inside of this circle to start the pit. Using a rake even out the gravel. Use enough gravel to ensure there is at least two to four inches inside of the ring. This is going to be the base of the fire pit and should be leveled. This may take some time, but it will be worth it in the end when there is a nice even walking surface. Unless taking a lot of breaks is part of the plan, gathering a few friends to help is needed. This is a lot of heavy lifting and raking and it is very tiring. Using the string and stake measure out the diameter of the fire pit. Creating a small trench around the diameter of the fire pit will help mark where the stones will be placed. This is the fun part, putting together the pit. Take the cement mortar and sand and mix up a batch. The instructions for this should be printed on the bag. Use just enough to fill the bottom of the trench with the mortar. As the bottom is filled place the largest stones around the trench. Repeat this pattern and always check to make sure the stones are going to the correct place by pulling the string out to mark the diameter of the pit. Use the smaller stones to fill in any gaps that the large stones create. With whatever kind of sand was chosen and fill the inside of the fire ring. There should be a layer of sand four inches deep on the inner portion of the fire ring. Try not to bump into the stones. They are attempting to set with the cement mix. Any movement can stop this process. The outer perimeter of the sandpit needs to be trenched. Once the entire outer ring is trenched it will be filled with the smaller stones to create an exact barrier for the sand on the inside. Use the mortar to set this smaller stones. It is time to put in the sand that will fill the area from the outside of the fire pit until it reaches the outer stone perimeter. This sand should be about four inches deep once it is fully poured. Using a rake can help spread the sand quickly. To get the hard to reach areas use a hand trowel. This will help the sand reach the small crevices created by the rocks. Be careful not to knock into any rocks that are still setting. Putting mulch around the outer stone perimeter will help to cover any blemishes or extra materials that have spilled out during the creation process. It also helps to create a contrast of color depending on the color choices. A white sand and a dark mulch can help the landscaping stick out a little more. Add in some chairs for a complete fire pit look. If looking for a sophisticated and clean look for the fire pit consider adding some decorative pebbles to the mix. These decorative pebbles come in all shapes, sizes, and colors so it can be easy to add a little bit of flare to a project like this. One source to purchase this type of fire glass is from Exotic Pebbles & Glass. This company has pebbles in three different sizes. There are small pebbles that are one-half to one inch, medium that are one inch to two inches, and large that are two inches to three inches in size. Depending on the look that is achieved different sizes may be needed. Mixing sizes together can create a more dynamic look but it can make for a less even surface. Exotic Pebbles & Glass uses decorative pebbles that are natural. They come in either a polished version that has been smooth and shinned to have a more finished look. For projects that are a bit more rustic and natural, there is a “natural collection”. These rocks are not smoothed and look like they were just plucked from the ground. These pebbles have a nice variety of color to them. Many of them have multiple shades of colors like browns, golds, grays, and yellows. These many colors will look great beside the natural look of the larger rocks used for the fire pit. For a real wow-factor use the Snow White Pebbles or the High Polished Black Pebbles. Both of these have very distinct colors that will really pop. These pebbles are great to use beside any walkway leading to a fire pit. If there is a sidewalk or a more natural rock walkway use these pebbles to lead the way. Simple outline the walkway with some brick or sidewalk edging. Then fill in the area with any variety of pebble. There are some great landscaping ideas here in this post if you want more inspiration. Another idea is to use them on the outer perimeter. They can be a great alternative to using the smaller stones. Use a sidewalk edger or other stone to line the edge. Then add in these pebbles all around the fire pit. A fine white sand outlined with the High Polished Black Pebbles will look stunning. No matter what color choices or design choices are made this new fire pit will be a great addition to the home. This project does not have to cost a lot or be done by a professional. It is easy to do and even easier to relax around once it is finished. The best way to get this project done quickly is to invite over a few friends with promises of a nice fire to sit around once it is complete. A regular fire pit is fine. It gets the job done and there are always great times spent on cold nights around a fire. The sand fire pit is the whole package. This project helps elevate the lawn to a sophisticated level. The beauty the project brings will make neighbors envious. Once completed it is going to be a spot that is frequented by friends and family. Many get-togethers will take place around this fire pit. Memories and photos will be captured here. Make sure they are on a beautiful backdrop like a completed sand fire pit. Having a rock garden in the landscaping plan can help to break up a sea of green. Rock gardens come in all shapes and sizes and can be anything that the creator wants. The beauty of a rock garden is that it is so personal. A great rock garden has personality and specific design choices. Check out our article covering landscaping rocks and design ideas here. The only real requirement for a successful rock garden is rocks. These rocks can be small as pebbles or as large as boulders. Depending on the style and look of the garden. Many people choose to incorporate different plants into these gardens as well. Small plants like succulents, flowers, bushes, and even trees. Anything that is typically found outdoors or in a garden can be incorporated into a rock garden. Lawn decorations, vases, pottery, and so much more. Take a walk through the landscaping area in the local hardware store. Ideas will spring from the shelves into the cart. Once the designing process starts it will be hard to stop. Executing a rock garden does take some planning. Whether this is the first rock garden that is being added to the yard or an expansion, there are a few aspects to consider. The size of the garden is important depending on the effort being put in. Shapes and sizes of the rocks should vary. Choosing the right plants to add in is important to the total appeal. The overall design of the garden and the designs in the rocks can bring out more beauty. The final portion to consider is the location of the rock garden. This is important depending on the scale of the project and the type of garden desired. Taking the time to plan out the garden is going to make the entire process much easier. No picture or guide needs to be followed exactly, but it can be helpful to look at a few for inspiration. Find an area, think about the amount of rock versus plants wanted or needed, and think about the overall design. Even if it is just a few ideas on a piece of paper, it is something to refer back to. A great company to find the smaller rocks is Exotic Pebbles & Glass. This company has a wide variety of items that make landscaping much easier and so beautiful. Their decorative pebbles come in a wide variety of sizes, colors, and finishes. It is easy to select from one of their variations to add to a rock garden. A gorgeous choice is the Snow White Pebbles. These pebbles come in different sizes which is perfect for a design that needs a little variation. They truly are a stunning white and can create a lot of contrast in the garden area. They bring so much to a rock garden that there are many ideas centered around the idea of a white rock garden. Take some inspiration from a few of these ideas. While having a large rock garden is appealing it is not recommended to start with one. Designing and executing a large rock garden is going to take a lot of work, dedication, and time. There will be mistakes and eventually extreme frustration. Starting small will help teach some technique and allow a general design to come to life. Even if starting small means building around it to create a larger garden, eventually. Making a long-term plan is a great way to start a rock garden. If building any sort of long-term garden is too daunting, start in the house. A small rock garden can be very calming in an office or the family room. Grab a deep tray that is not going to allow rocks to spill over the side. Then fill it with any rocks or plants that look great with the décor. Using the smaller Snow White Pebbles in a tray with succulents can make a wonderful first rock garden. They are also a fairly easy plant to take care of. Placement of the succulents is completely up to the designer. On the edges of the tray can make a bright green border. Or along the middle like a flowing stream. So long as there is a separation between the dirt and the rocks it is going to create a nice clean line that will show off any pattern that is chosen. Once comfortable designing in the home it is time to bring that inspiration outside. Start with a small patch of land and transfer the tiny garden outdoors. Use the indoor garden as guidance for the next larger project. Purchase larger rocks and plants to add in. A rock garden that has a variety of sizes of rocks or pebbles is much more dynamic than one that does not. It can add depth to the garden and there will be areas that plants will nestle in nicely. If planned correctly large rocks can help frame where taller plants are growing. Using the smaller rocks in front and allowing them to grow larger as they move back is helpful so nothing is covered up by too large of a rock. Even if there is only a slight variation in rock size. If a more flat rock garden is desired used a variety of pebble sizes. Exotic Pebbles & Glass uses different fire glass types and three main sizes for their pebbles. The small has pebbles that are one-half inch to one inch. Medium ranges from one inch to two inches and large is from two inches to three inches. This gives enough impact that it can create a dynamic look. Lining the main area with the small Snow White Pebbles and building off that base is a good way to create contrast. The stark white is a great backdrop for a variety of colored rocks, plants, or sculptures. Using accent colors against the while draws people’s attention as soon as they walk in the garden. Many plants work well in a rock garden. There is not saying that a tree cannot be the centerpiece of the garden. Whatever brings inspiration should be used. Some plants are more common to see in rock gardens depending on the type of garden. There are some rock gardens that draw inspiration from flowers off the side of the mountain. This is a very natural looking rock garden and can be a beautiful accent to a more rustic area. The other way people lean is a smaller rock oriented garden. Where rocks are dominant and plants are placed in as accents. Whichever type is chosen can help determine the type of plants used. For a mountain inspired rock garden smaller plants are typically used. These include some bulbs like daffodils. These rock gardens tend to have a more carefully overgrown look to them. Creeping plans are great to blend in the mixture of rocks and plants together. These creeping plants will break up the hard edges of the larger rocks typically seen in this type of garden. They still allow the rock to be present and seen it is just not as rough. Succulents are a great in between plant. They work well with either type of rock garden. It is so easy to slip a few succulents into those smaller places that just need a bit of green. A more rock dominated rock garden can have a variety of plants. Typically these plants are well maintained and pruned for a much more clean look. The plants will be contained within a pot, or a small area of dirt. The smaller rocks used in this style will cut a clean line where the plant ends and the rocks begin. This design style is much more modern. It looks like a finished landscaping project more than a romp around the hills. Many people use this around the edges of houses, walkways, or patios. Since there are very clean crisp lines here this style works well to accentuate that. This modern look for rock gardens greatly benefits from the white of the Snow White Pebbles. Use a few of the High Polished Black Pebbles to really create a stir. These two colors combat each other and will help to create those clean lines or borders. Plants that can be pruned work well in this style. Small bushes, a few small trees, or even flowers that do not have too many leaves will look pristine. A rock garden that contains little to no plants can be a great template for designs. These designs can be anything. Circles, swirls, squares, and even drawings of objects. There is no shortage of ideas to be put into a rock garden the only limitation, is execution. The best part is that these designs can be changed. Simply rake the rocks back into position and start again. To create these designs it is easiest to use a wooden rake. Depending on how large of an area is being cultivated. If it is a smaller garden a smaller shovel may be used. Take the time to create different patterns in the garden. It can be relaxing to explore the many options. This type of garden is typically referred to as a Zen garden and sometimes works best with a sand mixture with the small stones or gravel. The small Snow White Pebbles are great for a smaller area to design in. They give off a very clean and serene appearance and will help the designer feel relaxed. Where the rock garden is located will change how the design will take form. A small rock garden in the middle of the yard has much more freedom that and small rock garden in the corner of the house and steps. Size can be affected by the location and extensive design elements are harder to fit into a small rock garden. Scope out the yard. Look for areas that look bare. If there are any that could use a little extra flare, brainstorm about a rock garden. Look for areas that are trapped between any structure and sidewalks or patios. They can be a great place to start a rock garden. A nice rectangle cut out of the yard where the sidewalk runs along the house can look much more inviting with plants alongside it. Lay a good later of Snow White Pebbles and make sure to hold them in with a sidewalk edge. Find a few areas to add in a couple pops of colors with plants. The brighter the better. People will love walking up to the home with bright reds, yellows, and oranges lining their way. If flowers are not preferred any favorite plant will do. A small bush is just as welcoming and will still brighten their day. Draw inspiration from pictures and guides. Never feel obligated to follow these too closely. Add in a little extra flare to any design. Pops of color from flowers or from pottery can really change the look of a rock garden. Make sure the rock garden is personalized to fit the designer and the house. Choose a variety of landscaping rocks, plants, and designs to really make the rock garden unique. The Snow White Pebbles are a good choice for anyone looking to have a modern rock garden to add to their landscaping. They are easy to use as a clean backdrop for whatever design is desired. Backyards have become more of home extensions in the recent past, which is why we felt compelled to share backyard design ideas with our fellow Exotic Pebbles and Glass following! More and more people are landscaping their backyards for increased outdoor living space to unwind with family and friends. Depending on the backyard design ideas you choose for your backyard, it also can act as a recreational space. That said, the current trend of backyard design is seeing indoor amenities including fully equipped kitchens, and fireplaces being incorporated into the backyard design ideas. With proper planning, design, and construction, you can create a backyard that is the envy of your friends and family. In addition to this, your backyard landscaping will increase your home’s monetary value. That said, when embarking on a project for your backyard design idea, it is best you start with a plan. Spend ample time collecting backyard design ideas, looking at different images before you dive in nose first into the project. For this, we have got you covered with 6 of the best backyard design ideas the 21st century has to offer. Back in the 1970s, decorative stones were the go-to landscaping material for most homeowners. Recent backyard design ideas have seen their use resurface. Decorative pebbles sport stunning natural color and beauty that adds texture to backyard landscaping. But aside from their timeless appearance, decorative pebbles have proven to be easy to install as well as maintain that other landscaping options like grass. Unlike grass, they do not require watering and constant trimming. They do not experience discoloration or decomposition and best of all, they not easily blown away. They can withstand the extremities of seasons with grace. That said, decorative pebbles vary in color, size, and shape. This allows them to complement different backyard design ideas. Below are some great ways to incorporate these decorative pebbles into your landscaping project. It proves rather difficult to decorate drainages without blocking the flow of water. Pebbles, however, offer a perfect solution. Adding them to your backyard drains or grates adds some life to the drains while retaining the flow of water. If you have an eroded pathway or an uneven corner that just bothers you so much every time you see it, decorative pebbles will offer you great and even coverage. In addition to this, depending on the pebble type you choose, you will get to add more color to your backyard. For an instant facelift, you can place pebbles over your weed mats. If you intend to use these decorative pebbles on areas that see a lot of foot traffic, it is best to use 20-30mm pebbles that sport a depth coverage of 50-70mm. Tree bases, depending on the backyard design idea you are going for, are beautiful. That said, you can increase its visual appeal with pebbles of different colors. You may use the pebbles to even the ground on the tree base. To achieve this one of a kind backyard design idea, start by surrounding the tree with large rocks or bricks to form a boundary and then fill up the resulting space with decorative pebbles of your choice. Pebbles can be used to provide you with a unique and stylish pathway. They define pathways and are best used with stepping stones. The decorative pebbles that you choose should complement the color steppers. If you want to steppers to pop out more, use pebbles of a contrasting color. For more texture, you can mix up the pebble colors and sizes. Given their non-decomposing feature, you can use them as mulch for the garden bed in your backyard. Used as a mulch, they will protect the soil from erosion and prevent the growth of weeds. What is even exciting is the fact that pebble mulch is durable and as such you need not change it every so often. They last for ages. With decorative stone pebbles, you can create a stunning patterned landscape on your lawn. Outline the art with pebbles. Heck if you want you can come up with a small-sized maze, a chequerboard or just huge spheres. The pebbles can be to outline or fill the patterns you create. Either way, the results are bound to be stunning and an awesome conversation starter. Exotic pebbles & glass has a wide range of natural and eco-friendly pebbles. They source these from different parts of the world and make them available to you. The pebbles come in different sizes and colors and in 3 different packaging (50 lb, 20lb, and 5lb). Outdoor fires are so cool. For the longest time, fireplaces were seen as being perfect for the interior of a house. However, times have changed and more and more people are incorporating stone walled pits, with varying designs and finishing into their backyard landscape designs. And why not? They are the perfect place to melt your marshmallows and add great light and life to your backyard, even at night. That said, if you are considering this backyard design idea, you best learn how to do it right. There are several considerations that go into building the perfect fire area. At the very top of the list is our expert backyard design ideas, followed by hardware, then materials and lastly the construction of your fire pit. In order to enjoy your backyard fire pit, you will have to consider its location. It should be the safest point in your backyard. Ensure that the land is level and away from combustibles to avoid any fire accidents. For improved safety, you can also add a screen to cover your fire pits. There are several fuel types available on the market. These include wood, propane gas, natural gas, and alcohol. All of these have their pros and cons. This is one of the most natural and eco-friendly approaches to a fire pit, and at the top of our list for our backyard design ideas. This fire pit can run on both natural and propane gas. The fire does not burn the glass in the fire pit, but rather acts like a filler and heat emitter for people sitting around it. With this fire pit type, you can burn petroleum gas in liquid form. When using this fuel type, you should ensure there is proper ventilation. A golden rule of thumb is to have two vents at 180 inches apart. In the event you intend to use fire glass, you should ensure that it is at least 1 inch above the fire pit burner. Be sure not to have too much material over the burner as you might end up trapping the gas leading to disastrous burst flames. Also, using propane as fuel, you should ensure that it is well mixed with air. To achieve proper mixing, you will have to include an air-fuel mixer. Failure to incorporate this unit will lead to very sooty fires. There are different hardware that forms the perfect fire pit. These include burners, igniter, burner pans, air mixers, piping, and valves. Depending on the fire pit design you choose, you will use a match, button spark igniter or an automatic igniter to light the pit. Of all the igniter types, the automatic type is most expensive. When choosing your burner, you should prefer the stainless steel type. They are usually of better build and quality. Speaking of which, we have a range of different shapes and sizes to choose from. When building and designing your fire pit, you will need to consider your material carefully. Why? Well, because they come in a range of different sizes, shapes, and colors. Whichever material you choose, ensure they are fire grade. You should not pick rock, gravel, stones, regular glass or ceramics to construct your fire pit as they tend to explode when exposed to high heat. Now, knowing what goes into building a perfect fire pit is only one part of the equation. To build a stunning fire pit is another. That said, you should research to get some inspiration for cool fire pit designs. You can build your fire pit large or small, with a small pit or a large pit and in any shape you prefer. But when you are done designing and constructing, be sure to use fire glass as filler on your fire pit. They make a fire pit more attractive than wood or logs. The best part is that they are environmentally friendly and come in many different styles and colors. Truth be told, it is not always that backyard landscapes can be changed. And even when they can be changed, sometimes the process is expensive than the alternative. That being said, it does not mean that all hope is lost. As a matter of fact, you still have a card up your sleeve to turn things around for you. Outdoor privacy panels are one of the latest elements you could incorporate into your backyard design idea. However, unlike many of the other elements we have looked at in this piece, outdoor privacy elements are more of subtractive than additive elements. Subtractive in this case means that with these outdoor privacy panels, you have the ability to remove some features of your backyard that you do not want your neighbors to have a view of. They only see what you ‘allow’ them to see. In the past couple of years, outdoor privacy panels have increased in popularity to hide things. They are after all privacy panels. Exotic Pebbles and Glass avails outdoor privacy panels with a privacy rating of between 60 and 90%. Visibility is limited from both sides. This characteristic as such affords you some intimacy and ability to relax in the space. The high privacy rating is best for creating the intimate environment. But this is not to say that you cannot achieve the same with semitransparent panels. You can. All you have to do with the semitransparent panels is install more lighting on the outside than on the inside. This will give you an isolating effect. If you are working with a small space, you should only strive to shield or segment and not close up completely. Segmenting is more of adding a layer of obstruction for the viewer. The resulting design stimulates the imagination and adds to it a volumetric complexity. To give it a more dramatic effect, you could add some lighting at the bottom of the panels. Colorful beams shone on the patterned outdoor privacy panels will create an artistic visual everyone will love. However, adding lights is a little bit tricky as you have to consider the changing seasons. Different types of light will provide different temperature on the panel in different seasons. But while it is a bit tedious finding the perfect light and panel combination, when you do get it right, it is very rewarding. Landscaping glass provides a beauty that lasts for ages just like decorative pebbles. The landscaping glass makes transforms your backyard design idea into a piece of art seemingly done by a professional in the industry. And in case you are wondering, there are many places you could incorporate landscaping glass in your backyard – the sky is the limit with these possibilities. The variety of sizes and colors add to the numerous designs you could pull off. There isn’t a backyard that is complete without a flower basket or a flower pot. Potted Flowers lead our list of backyard design ideas because of there ease of installation and the great job they do of sprucing up any area. They add life to the spaces they are placed. As such, it is only right that we create a beautiful environment around them as well. Adding glass to your flower pots will provide your landscape with more color. Instead of having dirt at the base of your flowers, use landscape glass of whatever size and color that pleases you. Just make sure it complements the beauty of the flowers. If you are looking to add some decorations to your landscaping backyard design ideas, but are not exactly in love with the idea of surrounding it with dirt or just wood chips (it has become too cliché), you can opt to use landscaping glass (colored). Mix up the colors to provide you with a more pleasant and interesting landscape design. If you love the general idea of having a faux pond, then, by all means, create it. A faux pond, needless to say, is a masterpiece on its own. You can surround the faux pond with an intricate design and have it act as the centerpiece of your backyard. In the bird birth, you could have a more natural design. Adding plants will achieve this better. And instead of having sand in the birdbath, you could fill it in landscaping glass. The Aqua Blue colored type would be perfect. Send us some of your favorite backyard design ideas for a chance to be featured on our social media and receive a gift card to purchase Exotic Pebbles and Glass products from Lowes! Using landscaping glass will not only provide you with great beauty, it also will ensure that you are relieved of all maintenance responsibilities of the pond and still have it look like a natural pond. Landscaping glass is one of the best pieces to use in creating an imitation of a flowing river. There are lots of blue hue variations that create a cool and interesting variation. For instance, from exotic Pebbles & Glass, you can get the Bahama blend that comes with a mix of light blue and dark blue hues. Truth be told, it is always hard to make a plant or flower bed look neat and clean. And rather than going through the trouble most people just leave dirt on them. But rather than allowing this to be a stumbling block to your backyard design ideas, explore other possibilities to make your ideas a reality. To achieve the look you have imagined, fill the plant bed with landscaping glass that complements the flowers best. It would be best is the glass color contrasts with the bed edge as this will give it a cleaner and more neat look. Using landscaping glass with the light blue hue color, you will end up giving an illusion of your plants floating in ocean blue water. Landscaping glass usage as pointed out is numerous. And the best part is that it is easy to hack. For the fire pit, you are considering of creating, there is a way to give it more oomph and attractiveness – fire glass. Now, besides fire glass being attractive, it is known to produce a lot more heat than actual wood. In addition, it is environmentally friendly. It does not produce smoke, it has no odor and best of all, does not produce ash. You are able to enjoy the fiery embers and warmth at night without negatively affecting the environment. But what is fire glass? Simply put, it is tempered glass used in fire pits and fireplaces as alternatives to fake wood and lava rocks. Itself it is not flammable and does not do anything when you light it. If you have an actual wood burning fire pit, it cannot act as the replacement for real wood. It has a great visual appeal and mostly works with gas burning fire pits. 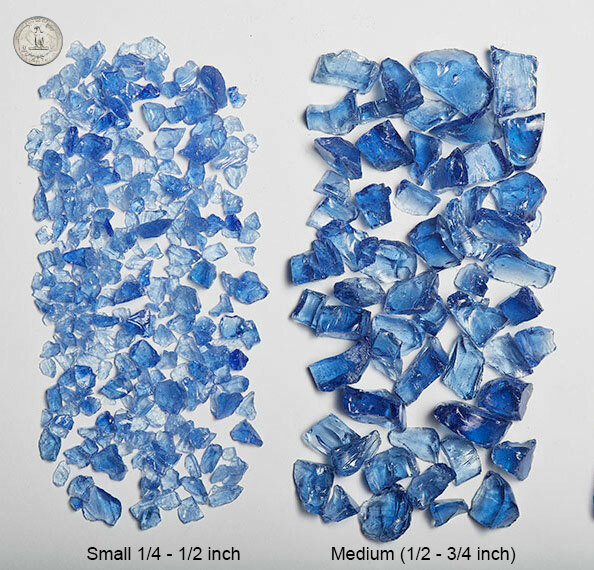 Exotic Pebbles & Glass has a wide variety of fire glass coming in different colors ranging from sky blue reflective to Tahitian teal reflective. Outdoor aquariums would be a great addition to your backyard. It adds an interesting touch and literally brings it to life. 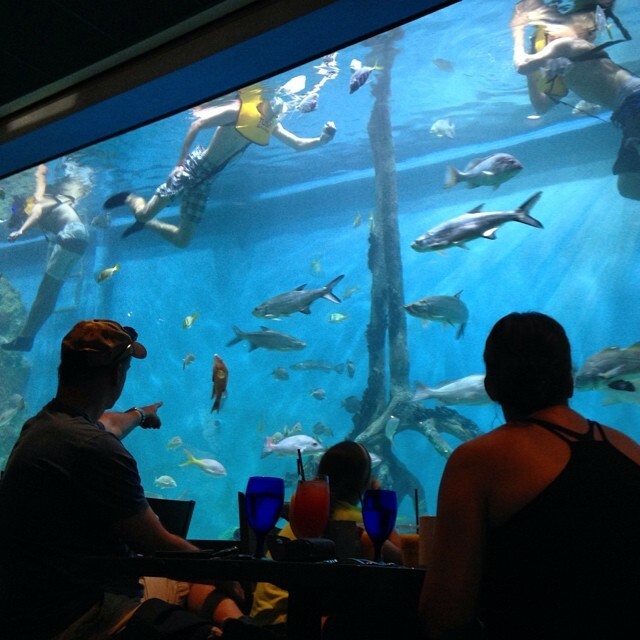 However, when you think of an aquarium, you probably will have an image of an indoor aquarium. Anything larger than that you automatically think is too expensive to bother with. Well, while buying one can be rather expensive, the process of creating one does not have to be – especially if you build it for yourself. Good thing, creating an outdoor aquarium is easy. You can replicate an ecosystem and have the aquarium with the perfect conditions for it to support fish. The size of aquatic life the aquarium supports will obviously depend on the size of the aquarium. Though we should mention, it might be challenging to build the structure. But with the proper guidelines, you can make create a functioning system at a low cost. That said, there is a factor that you need to consider – location. Choosing the right location for your backyard aquarium is imperative. It should be positioned in a place that it will definitely add beauty and still be away from direct sunlight. Additionally, the aquarium should be away from vibrations and drafts as these affect fish. You should avoid building an aquarium under a tree. There is just too much risk under a tree. There are a number of things that could go wrong. Location is critical to the success of the project in the long run. Also, depending on the prevailing climate, weather may also be a consideration you need to make. if you are in a cold region, you might want to have it in a greenhouse. The size of the aquarium is dependent on the quantity of fish you intend to have, materials and the available space. For material, glass is the most preferred material. Some use expensive acrylics. With the 6 backyard design idea, you should have something to recreate a small heaven in your backyard at low costs. Be sure to be creative in the process. What’s the main reason for putting up decorative fence panels? The main reason that people put up decorative fence panels in their yard is that they would like their yard to be aesthetically pleasing. They yearn for a more modern and designer looking barrier rather than a boring normal wooden or metal fence. The top reason for having a fence is for security. When you think about a fence, you likely envision an enclosed area around your property. Whatever the reason for your fence– for example, a designated border for the safety of your children or pets– you may, then, need a security fence that encompasses your entire yard leaving no gaps. However, securing your yard isn’t the only reason to put up a fence! Decorative fence panels can be used to revamp the look in your garden. The backyard space that your garden provides is precious. It gives you the opportunity for outdoor living, enjoyment of natural air, and relative tranquility. While the first thing that comes to mind when thinking about enhancing the appearance of your garden may be a well-manicured lawn, bordered flower beds and beautiful patio furniture, you may also want to consider your fencing. The fence borders your property and adds security and privacy. How your fence appears can dramatically affect the appearance of your garden in general. Whereas you can revamp the look of your existing fence with a lick of paint and some touch-up repairs if your fence is looking worn out, ratty and weak, then it is most likely the best time to put resources into a new one. A fence should be thought of as an investment; buy it wisely, and it will serve you for years. Decorative fence screens add shade, privacy, intrigue, and magnificence to your home exterior. Decorative garden panels are gaining popularity by the day as they are among the top home improvement ideas to consider. Regardless of whether it be a DIY house remodeling project, professional landscaping, interior design or architectural and commercial building restructure, decorative fence panels provide beautiful style and visual drama. Fence panels also offer efficient partitioning of open spaces to provide privacy or create simple sunshade. Simply put; one’s imagination only limits the creative possibilities. Often referred to as outdoor privacy panels, they may at first seem straightforward. However, there are numerous shapes and styles of decorative garden panels available in the market today that can truly give your garden the WOW factor, while also keeping your privacy. There were days when you could kick back, relax and savor the glorious solitude in your backyard. Then the neighbors next door cut down the trees on their lot, and the family on the other side redesigned their home to include a second-story deck with fantastic views of the neighborhood that includes a full view of your yard! Suddenly you feel like “big brother” is watching. If you live in such an area, then privacy is at a premium. And it isn’t just about noisy neighbors invading your space – you may also want to block your own view of the neighbor’s yard. There’s a myriad of backyard design ideas using decorative fence panels that offers privacy without feeling claustrophobic in your enclosed garden. Your fence doesn’t really have to block the entrance to your yard. By using just a few decorative fence panels, you can create a clear boundary between your yard and your neighbors. With a little bit of creative backyard design ideas, you can enclose your space in your yard without blocking the view, so your garden feels open rather than closed off. It’s astonishing what impression a bit of fencing can make! You can keep your yard open while still clearly outlining the boundaries around your property using corner fences. A corner fence is a beautiful decor element that includes two fence pieces making an angle– like the corners of a rectangle – but without the other part of the fence that links one corner to the other. If you put one at each edge of your yard, anyone viewing your property will quickly imagine invisible lines connecting to the corners. Furthermore, decorative fence panels used in corner fences are an incredible compliment to the landscape and are simple to incorporate into other backyard design ideas. If you’d like to add more design elements, go ahead and add decorative glass pebbles in your corners or add little flower beds and finish off each corner with landscape glass! Garden panels are an excellent choice for showing off your plants while conveying a typical American style to your yard. Adding decorative fence panels highlights (or hides) your yard’s attributes. Coverup fences: Do you have a hideous generator plainly displayed in your yard, or are recycling cans and trash ruining your landscaping design? Probably your garden tools and supplies are cramped on one side of our yard because you don’t have a shed? These unattractive features in your backyard can be quickly fixed by building a mini decorative fence around them. Well installed decorative fence panels will not only conceal the lesser appealing highlights of your yard, but it can also add a beautiful look to your landscaping design. For this reason, a strong and sturdy decorative fence panel works best. Panels with 60% – 80% privacy will also do a great job in concealing unsightly features in your backyard. Decorative garden panels: If you have a garden, you naturally want to show it off, but while leaving it open, your kids or pets may damage it. Building a mini fence around your little garden will stop hungry critters and unwelcome fuzzy guests while enhancing its beauty. Installing a lattice fence that features 60% privacy is an excellent way of confining your garden without taking away the attractiveness that your plants provide. Spa and Pool Fences: There are plenty of backyard design ideas using decorative fence panels that you can use to create stunning customization for your pool or outdoor hot tub. The pool area is another feature in your backyard that may warrant special fencing to provide privacy both for your guest and family while taking a dip. Try a Marrakesh garden screen panel which is made up of hardwood and so it will hold up against any water splashes! Alternatively, construct a visually striking feature wall using naturally looking Daintree decorative fence panels which blend well with your garden layout, provides up to 80% privacy and maintains a harmonious aesthetic with the rest of your house exterior design. 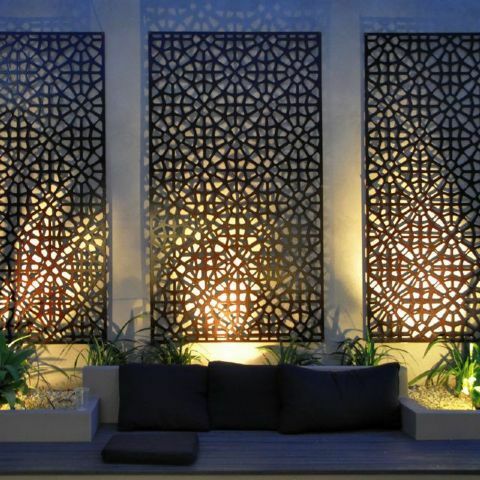 The adaptability of decorative fence panels allows high-level customization such that you can easily incorporate back-lit LED strips, slat in-fills or custom tile veneers among other design that will add that “wow factor” to your space. 4. Do you still need to conceal more gaps in your hedges? Add decorative fence panels on the gaps. Considering the ideas discussed above, it is quite clear that – fences aren’t just for confinement, and don’t have to be restricted to your property’s perimeter. Using fence panels as decorative features allows you to harness the personification of your landscape design. Should you be looking for a new DIY project, then finding an exciting way to include fencing in your backyard design ideas could be it! Fences are typically made up of panels or segments, instead of one long piece that runs along the whole perimeter. Decorative fence panels can be made of metal, hardwood, concrete, vinyl or any composite material. Each board has horizontal or vertical panels on their exteriors held together by two or more cross posts. Having fences sold in multiple components offer a great deal of flexibility which allows you to execute any of your backyard design ideas quickly. Pre-made decorative fence panels come in various styles, widths, and heights. The standard sizes in the market include 24×48 inches and 48×70 inches and offer 60%, 80%, and 90% privacy. To determine how many panels are needed for your project, the first thing you need to do is settle on a standard fence panel length. After that, measure the perimeter of the space you intend to close and divide the findings by the length of each fence panel. Supporting posts are put up on each interval of the panel’s length, for example, you will install one post after every 70 inches when installing 48×70 decorative privacy panels. Furthermore, each post is fixed with lad screws at the center of each panel. For metal decorative fence panels, the metal posts come pre-punched to enable easier mounting. Decorative fence panels used in residential structures are mostly made of hardwood, metal or vinyl. Wood garden panels are the popular choice. Hardwood is not only economical when purchasing pre-made, but they also provide natural look which will incorporate well with any backyard design ideas. One significant advantage of buying pre-manufactured decorative fence panels online is time. As opposed to laboriously making each fence panel from scratch, you have the benefit of skipping that tedious work and moving directly to setting up and installing the fence panels themselves. This implies that your DIY decorative fence panels installation can take just a single weekend to complete, this includes fence preparation, instead of spending multiple weeks. Have your backyard design done and ready for spring and summer faster! The second advantage of using pre-made fence panels is quality. You can buy decorative fence panels online from a trusted dealer like Outdeco without worrying about quality or conformity. Industrial manufacturers of fence panels finish and inspect each board by hand and maintain high-quality control process to guarantee a uniform quality of each decorative panel. Use the Leafstream decorative panel to hide your air conditioning unit. Even though we all acknowledge the importance of air conditioning in our homes, the a/c unit in the backyard is not so attractive. Use Outdeco’s decorative Leafstream panels to hide the unattractive air conditioner. Made of high-quality Australian hardwood, these boards have tasteful design and will beautify your backyard. Leafstream panels are available in 24×48 inches with 60% privacy. Combine three Leafstream panels to hide your air conditioning unit attractively quickly. Leafstream panels are hinged on the side for quick installation. Made of Australian natural and highly durable hardwood. Quick set up. Easy to move around and store. This Decorative fence panel is a favorite for being used to hide trash cans or create a boundary anywhere in your yard. The dark-colored woodwork of this beautiful Mahjong fence panel will look incredible wherever you choose to fix it. The square sections provide ample space to grow plants. Mount it on the exterior walls in your home to create a vertical garden trellis for your vines. Alternatively, you can use it in your garden for growing climbing vegetables like peas and tomatoes. The trellis can likewise be set up on a porch or deck to create a natural themed look. With a durable wood casing and cross-section design, this decorative fence panel offers a unique appeal and ample space for your favorite plants to grow beautifully. The Bungalow decorative fence panels are made out of natural Australian grown hardwood and can be installed anyplace including on the yard, around the pool, patio, deck, garden, indoors or on the balcony. The panels are quick to install thus giving you the chance to try out different garden design ideas if you are looking for the perfect look. Bungalow fence panels are made of the lovely Australian hardwood, a natural hardwood growing in protected forests. Outdeco’s hardwood products are highly resistant to termites, fungi, decay, and rot. Moreover, the wood is carefully dried in a furnace before production. Set four Bungalow panels to create a unique yet beautiful boundary between you and your neighbor’s property or set up a mini fence to protect your garden from your kids or pets. Bungalow panels provide privacy and hardwood. It is incredibly durableRepels insects and water resistant to decay and rot rich in color. The Marakesh hardwood decorative fence panels add privacy and magnificence and to your outdoor living areas. The panel’s vibrant wood finish originates from Australian natural forests. The fence panel provides warmth, concealment and contemporary style to pools, backyards, walkways, and patios. Marakesh hardwood panel is highly durable, which means it is resistant to scratches, fungus, warping, rust, and rot. The panel’s surface is finished with natural oils which are antibacterial and hydro repellant. Easy to join with other panels. Do you want to ensure additional privacy or do a makeover to showcase an alluring decorative theme in your indoor or outdoor living space? This excellent Star Anis fence panel features a strong wooden board in rich dark color to offer a chic layout that certainly adds a visually appealing look to any backyard design ideas you are trying out. Thanks to the quick installation of each Star Anis panel, you can swiftly adjust the size of your fence in length or height as required. You can as well quickly dismantle the frames for convenient storage. A stylish way to create a boundary either in a room or backyard, this Star Anis decorative fence is the perfect choice to adjust your design options as you like. An elegant deluxe fence panel that makes it easy to divide a room or mark boundaries in a property. perfect choice for adding visual appeal to your decor easy to adjust the size in both length and height. Quick set up. Will only take you a few hours to install. Herringbone decorative panels are the perfect decor addition to any backyard. These outside garden screens hide unattractive gardening tools and other yard items, add privacy to your yard or completely separate your backyard from the neighbors. Use this decorative panels to conceal all your garbage cans, bikes, a/c unit, recyclables or lawnmowers. Herringbone fence panels are UV-resistant and not only makes your outdoors neater, but they also require no maintenance, new paint job or repairs due to mildew or rot. The wavy like design provides 80% privacy levels. The aesthetical design is on both sides. Connect various Herringbone panels to create a perimeter fence. Daintree decorative fence panels are a makeover alternative to the standard horizontal fencing boards. In case you’re looking for creative backyard design ideas that will stylishly create a boundary or divide an area of your backyard like a patio or shed, then these cutting edge wooden Daintree fence panels are perfect. These international quality fence panels are laser cut to form leaf-like partners closely spaced to provide 80% and 90% privacy levels. The design shows on each side of the panel which is both well finished. Two or more Daintree panels can be joined to form a fence around your yard, or you can install it vertically as a material for your plants to grow on. – Perfect fence panels for nature-themed decor. – Popular decorative fence panel. – Modern contemporary styling with elegant finish. Protect your pets and kids with this polished Orient decorative fence panel offering a stylish and complex design. This 70-inch-high fence panel checks most legal requirement in the pool code, and with tiny holes features in the design, each panel has minimal space in between thus making it completely secure for your kids and pets. Connecting different panels creates a continues groove, which is not only beautiful but ensures maximum levels of 90%. Additionally, the Orient decorative fence panels are highly adaptable and portable. Each panel is sold as a single unit of 48×70 inches. Depending on the size of your project, you can buy several panels and easily assemble them within no time at all. To install a couple of Orient panels, dig holes that are about 2ft deep, insert the post in the holes and cover with concrete footings. Orient decorative fence panels are made of high-quality hardwood and designed to provide quick and easy assembly. This is the perfect panels for protection and safety in your pool or yard. Premium weather-resistant hardwood offers a natural look of well-polished wood that needs no maintenance. Orient is manufactured in professional-grade quality. It is better looking, stronger and resistant to UV rays. Quick setup and installation means you can quickly do it yourself and be done in no time. Each panel is sold separately and comes in 48×70 inches with 90% privacy levels. Above is a fantastic range or sustainable decorative fence panels for all backyard design ideas and DIY projects. Regardless of whether you are looking to add privacy, shading, visual screening, patio partitioning or you are just looking to do a makeover of your outdoor living space, there are different privacy levels and unique designs to match your taste. Outdeco decorative fence panels are made of high-quality Australian hardwood. The boards are affordable and adaptable to any backyard design ideas. Each board comes ready to install. Buy decorative fence panels online today. There is so much you can do around a fire place or pit in your yard or garden. In-ground fire pits are distinct in the feature that they contain the fire within its sphere and the flames evoke directly from the ground. This type of fire pits are exclusive for outdoors and can transform the aesthesis of a simple yard, patio or garden, into a cozy, warm and luxurious area. Here are some modern and eclectic in-ground fire pit ideas to decorate your outdoor space. Fire Glass is a brilliant alternative to woods and logs. The beautiful fire glass, available in diverse colors, shapes, and sizes looks stunning against the flame and creates a clean and relaxing ambiance that can transform the look of underground fire pits, whether it’s a complexly paved and decorated one, or a simple hole in the ground. Fire glass is tempered glass that does not burn and instead, holds the fire for a long period in both natural gas and propane fire pits. They also have blunt edges that make them safe for handling with naked hands. Modern in-ground fire pit ideas largely include fire glass instead of logs, woods and other fire pit fillers, and may be used in both vented and non-vented pits, as they cause minimal smoke and pollution. However, do not use fire glass in wood burning fire applications and make sure you are using a vent free approved burner system. Fire glass is eco-friendly as it does not infuse toxic fumes and can be highly economic. In fact, you don’t even need to fill up the entire fire pit with exotic glasses, you can actually save money by using a cheaper base filler material, sand and gravel and use tempered glass filler on the top layer. However, do not use any porous material under fire glass, such as pebbles or lava rocks. An essential requirement to create underground fire pit is a hole in the ground and sufficient filler to hold the fire. 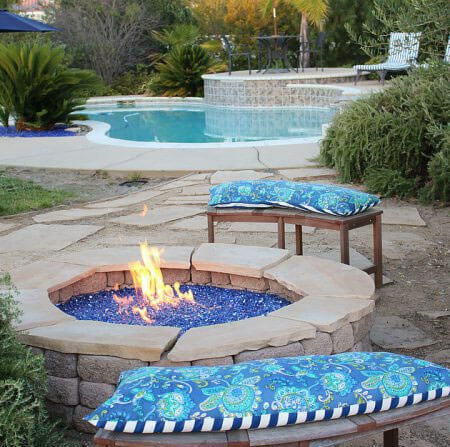 If you want to create a permanent in-ground fire pit built into your backyard or patio, this look can be achieved with concrete fire bricks or pavers around the submerged fire pit. In that case, you will need fire-rated bricks in and around the fire place, along with fire-rated adhesives during masonry. If you’re creating an in-ground fire pit in an existing concrete paver patio, make sure the pavers are fire-rated. Burning wood in concrete fire pits can be hazardous in the long run, as burning wood creates high temperature that might cause the concrete to expand, and eventually form cracks and fissures. Moreover, with continued contact with the extreme heat the concrete can absorb the heat and become too hot to touch, which can be dangerous since unlike metal, the heated concrete does not change color. The ideal thing to do would be to place the burner higher than the pit and avoid direct contact with the concrete as much as possible. These basic in-ground pit ideas are very easy to build on your own. You will need a proper open space and compliance from the local municipality to have an open fire pit in your property. With all the right materials, you can build it in a weekend’s span. However, you must know about the technicalities of proper ventilation and water drainage systems to make it worthwhile. Moreover, as interesting it may sound, safety is a major concern for having this type of open fire pit in the backyard, especially in moments of igniting your in-ground fire pit. Fires should never be started by kids without proper adult supervision. And if you don’t have avid knowledge, you should do some research or be well versed with all the safety norms, and enjoy your property safely. If you have pets and children, then you either light it while they are away or stay close to protect them from stumbling upon. Stonehenge is one of the classic in-ground fire pit ideas that lives on as the traditional design. And it’s truly timeless. You can achieve the look by stacking stone or boulder rocks on the basic structures of fire pits in your open space. It is ideal for both large and small areas, but you need to determine the size and type of stone that’s best for your space. If you want to invest on an expensive and premium stone, then the pre-sorted palletized stone is a brilliant idea, it is pallets of premium stones, that offer great compatibility with your in-ground fire pit. They can be expensive but equally high quality in terms of size, shape and robust outlook. It may be available at a stone yard. You can use pumice stone, basalt, granite and gneiss materials, but it’s better to avoid sandstone and shale rocks, as they often have air inside them, that risks explosion when comes in contact with fire. Stone lined fire pits make an excellent parapet or guard for children and pets, and create a medieval appearance worth admiring. Whether you have a small area or large, or if you are looking for fire place remodeling ideas, the rustic style can add a lot of class. It’s very easy to achieve, as fire pits require lesser space than fire places, and is ideal for small yard and even balconies, thus you can not only save a lot of space but also make small open spaces appear bigger. Use boulder rocks, to line your pit that of a standard size proportionate to the pit’s dimension and the outdoor space. Black fire glass or ceramic logs can be ideal to create the rustic, shabby chic character. But keep in mind, that rustic is best enjoyed when it only “looks” so, but is well maintained and clean. So considering fire glass is a good idea, because it’s low in maintenance than wood and logs. Create a seating area around it by just using some throw pillows or logs. The crackling sound and the warm effulgence can any day create a camp fire ambiance in the house, and the black, brown colored glasses give you a sophisticated classic outdoorsy feeling. Traditionally, underground fire places have a rustic appearance to them, but they can be so versatile and accommodate diverse styles of in-ground fire pit décor ideas. Modern designs are a lot about sleek and minimalistic designs that can be created with some exotic fire glass as a cleaner and minimalistic alternate to woods and longs granite lining is another feature to create this look. Fire glasses are excellent fire pit fillers and have a variety of colors that look very interesting, and since they are low on maintenance, it’s perfect for urban lifestyles. So if you want to host a party, wherein your guests will enjoy the most and remember the times for a long time, you can create a great ambiance by arranging it in our open area, without worrying about the cold. An open space, naturally adds a lot of freshness, and even amplifies your music. With a little imagination, you can create an underground fire pit with a combination of water. Landscape designers use water lining in fire pits to make it safer. You can have water lined in-ground fire pit in your open space with ease and minimum extra space. To create this you are going to need proper channeling that separates the water from the fire pit and proper drainage system. Also consider the water is not creating an obstruction in the way to reach the fire pit, so that you change logs or fire glass, and treat them. Water and fire creates an almost divine ambiance, in an open area and would be an incredible spot to have a romantic dinner for just the two of you. In order to avoid standing water, and ash diluted water, consider having a gravel lined drainage trench away from the bottom of the fire pit to a low spot on your property. Use simple drainage pipes to drain the water. It’s better to avoid plastic pipes to avoid any risk of contact with the fire and resulting disasters, you can use metal pipes instead. The crackling fire and a camping ambiance right in your yard is a great thing to have. So it’s better to ensure preparation against natural phenomenon like rain and wind protection for your open air fire pits. The compact and smaller dimension of in-ground fire pits are safer in comparison to above ground pits, in terms that they hold a very controlled flame, which does not leap unpredictably and has the potential of catching any overhanging tree leaves or the flying embers fluttering, thus reducing the risk of landing on any combustible articles nearby. So one can actually use in small spaces, and gardens, where there may be dense hanging leaves. However, in-ground fire pits are not entirely free of risks. Having the usual ground level holes in small spaces and in gardens with surrounding trees, can be dangerous for children, and especially pets, so that they don’t stumble upon it, or worse, cause any accidents while climbing trees around and stumble upon the fire. Stringent rules are not to be relied upon, it is better to consider proper safety covers and lining of the pits, especially you have pets and children at home. Fireplaces have been an object of affection, and one of the most wondrous backdrops for romantic moments, family gathering, or ceremonies and feasts. There can so much happening around the warm flames, and an exotic architecture around it. For the best fireplace remodeling ideas, follow the same rules you did when the creating the fire pit. You need to check again with the local municipality regarding any regulations about the remodeling. The ideal safety precaution entails that at a minimum 20 feet distance should be maintained from nearby structures, like shrubs, and trees and the main house. Landscapers suggest on keeping the pit base 6inches to 12inch deeper than the surrounding grade. This is the standard in-ground fire pit dimension. The basic idea for fire pits is to consider a certain diameter to accommodate a certain number of people to sit around, say a foot for more or less two people. If you have a very small space, then consider throw pillows to create a scattered seating arrangement in the ground. Also, remember that you will require maintaining a minimum distance between the fire and the seated, so plan things wisely. If you love cooking, then you create a paradise around your outdoor fire pit and popularize your den as a favorite spot for friends to host lively parties during the barbeque season. If you wish to create a rotisserie over an in-ground fire pit, then the ideal thing to do would be to build the fire base adeptly so that the flame reaches the food consistently, so as to cook the food, then heat it. While grilling is easy in fire pits since you can insert a skewer in, cooking barbeque and over rotisserie is a challenge as you have to position the stuff over the pit in such a way so that the flame reaches the food subsequently. You can incorporate some clever in-ground fire pit ideas depending on the depth you want your fire place. Design the pit ranging from six to 12inches, and don’t ignore the level base. Following this, dig a smaller circle inside the fire pit, about three to four inches deeper. This area should equal roughly one-third the fire pit diameter. For example, with a 24-inch-wide pit, dig an eight-inch circle in the center of the larger one. Fill this inner circle with rocks, sand or gravel to create a natural sump area for drainage. Top the entire fire pit base with two inches of sand. 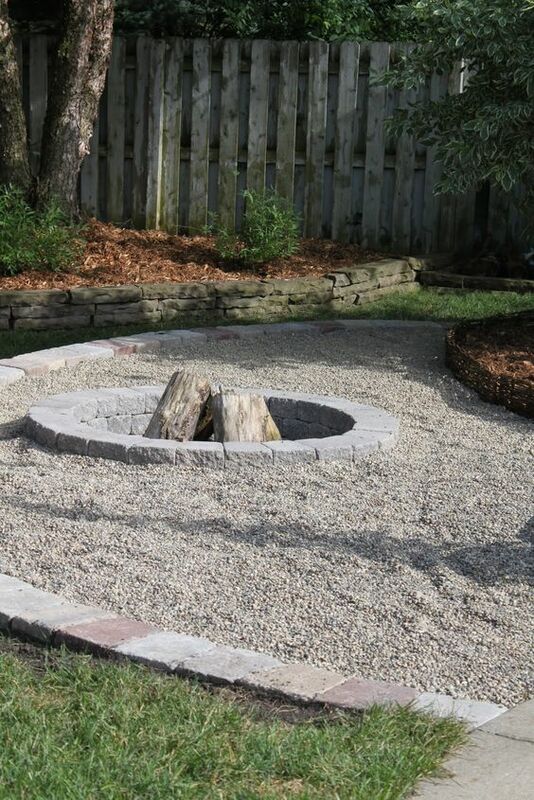 Surround the outer edge of the in-ground fire pit with stones or logs. In-ground fire places are a class apart, add a lot of character to the outdoor area, making it look rich and upscale. Such an area in the house has something for everyone, wherein children would love to enjoy a campfire; teens would love to party or the best place to spend a romantic evening, then heading to any fancy restaurant. Before you start building your very own fire pit, you need to consult with your city’s ordinances. This usually is taken care by the local municipality, who will give you an official compliance for the fire pit, and without this compliance, it will be illegal to build any kind of fireplace in your property. This might also levy a tax since it will add a new value to your property. The amount of which at will depend on the size and type of materials you are using for the pit. To make it low cost, you can first build a basic fireplace and then remodel it afterward, with your desired decoration, for which you will not have to pay any taxes. Another thing to consider is wind. Sometimes home owners fail to recognize the aspects of what heavy winds can do with the fire in an outdoor fire pit. While indoor fire places burn freely without the risk of the fire going out of control because of wind, outdoor fire pits carry the risk at large. Some areas have a warning sign of “no burn” as the wind can flutter the fire in an unmanageable way. In-ground fire pits though carry a greater safety quotient than other over ground types of an outdoor fireplace. Moreover, the wind will not only flutter the flame the woody smoke can go too far and might cause disturbance to your neighbors. It’s better to chuck the idea of lighting a fire on a windy night and better stay indoors. But if you have already made plans, and called in guests then you can consider keeping some alternates to aid the situation, especially if you live in a windy region. If you live in windy areas, then consider having a gas fire place instead of using logs and wood as your fuel. Or better, invest in an electronic outdoor fireplace system, that can be just turned off with a remote if the fire goes wild. You can use gel fireplaces that zero in on the smoke and lease exhaust emissions. Also, do not forget to buy a fire pit wind guard. Don’t neglect covering your fire pits when they are not in use. This is to prevent the fire place from rain, dust, and debris. Because damp or debris in between your pit fillers can cause a delayed ignition on time. You may keep the job for the weekends, but if it rains while you are away at work, then your weekends will just require more work around the fireplace. The open fireplace is not safe for kids, and especially innocent pets, who will not have the idea where to go and where not to. So never forget to cover your fireplaces when not in use. The in-ground fire pit ideas make an excellent hangout spot, for a variety of activities. When it comes to in-ground fire pits, it is not only the warmth of the fire in cold evenings, but this kind of fire pit is safer and easier to maintain than over ground fire pits. If you are going to build one in your home, or other property, like a resort, camp or children’s home, make sure to speak with your local authorities of your cities ordinances. The addition of a fire pit will add value to an existing property, so you are going to have to pay a certain tax for it. And if you are remodeling a previously built fire pit, never neglect to consult with the same authorities to steer clear any legal formalities. Different cities have different regulations regarding fire places and you should abide by them. The enclosed design of in-ground fire pits typically hold the fire in a constrained manner, that means, the warmth does not reach too far away from the fire place. So it is valid to say that in-ground fire places are ideal for small spaces, and this actually makes fire places to be cozier and requires close seating. This may add more charm to a gathering of close friends, and to a romantic date for two. However, as you need to maintain a minimum distance from the fire pit, not only for those that are seated around it but also the furniture, trees and other articles that are there in your space. Hence, if you already have a small and pact yard space, the in-ground fire pits is most likely to give your guests a cramped feeling than cozy. Whereas, as formal gathering and elaborate ceremonies like engagement or birthdays might seem a grand idea to host around the fire, if you have a moderate number of guests, it is ideal to host the ceremonies away from the fire place, and instead have a more relaxed, aftermath party hosted around the fire. Have a wise seating arrangement around your fire, and do not keep any combustible articles around your fire. It is ideal to ask your lady guests to not use spray perfumes and other inflammable cosmetics around the fire. Drinking alcohol around the fire, during parties should have some safety precautions beforehand; it is wise to make the arrangement away from the fire place in order to avoid any mishap. Also, be careful when you arrange for music and amplification systems around your fire. Consider live music in house parties. Landscaping glass is used to bring more color into your landscapes. The beauty found in this glass will not fade and it will make your landscaping look like it was designed by a professional. There are so many areas of your yard that you can use landscaping glass in. The possibilities are endless with the variety of colors and sizes of landscape glass that are available. No yard is complete without a few flower pots or baskets. Flowers of all colors should be included in a beautiful landscape design. To make your landscaping stand out even more add extra color in with landscaping glass. Instead of the bare dirt showing on top of the flower pot or basket you can cover it in whatever color makes the flowers pop. This flower basket has beautiful bright yellow and white flowers on top of the Bahama Blend landscaping glass. 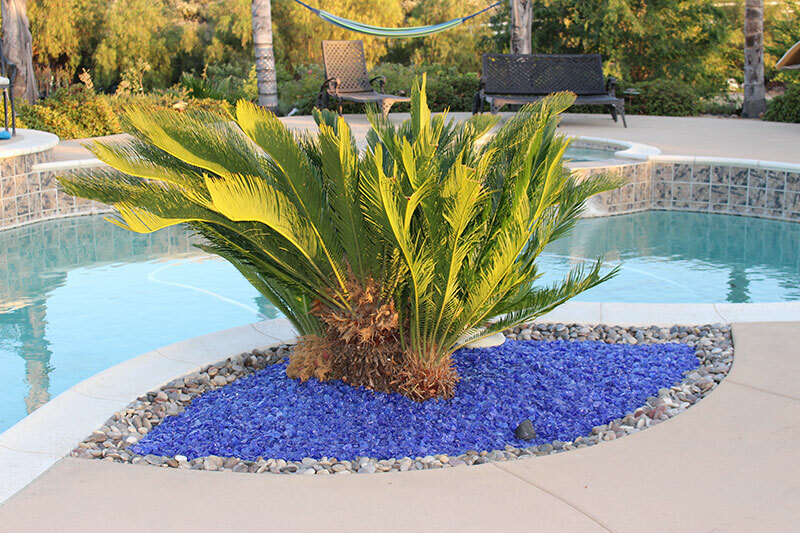 This mixture of blue landscaping glass gives the illusion of water surrounding the flowers. The flower basket is more vibrant and colorful than ever before. The landscaping glass gives new life to a tried and true landscape design. For those areas that you want to add decorations to your landscaping but do not want to use wood chips or bare dirt add some colored landscaping glass instead. Depending on what you are surrounding you can choose from a variety of colors to help match or contrast the décor. This large flower vase is a beautiful piece that has a mixture of blues throughout the surface. The Ocean Blue landscaping glass helps to bring out the color of this vase while creating a more clean look for your landscape design to help hide those unpleasant areas that do not have decorations in it. Mix the colors you have in an area to create a more interesting design. This area has many different vases and landscaping glass to create a colorful section of the yard or patio. This fixture is a beautiful piece of art on its own. The intricate design that surrounds this fountain creates a wonderful centerpiece to this large patio. The bird bath in the middle is filled with plants for a touch of nature. The base of the bird bath is a beautiful turquoise to help match the Aqua Blue Landscaping glass that fills it. Instead of having the maintenance of a true fountain or pond use landscaping glass to give the feel of one. With plants scattered throughout the landscaping glass this may appear to be a pond to anyone at first glance. It allows you to have a natural feel to your landscape without the added work of caring for and cleaning the fountain or pond. This is a great area for you to sit by and enjoy the sun. It has enough room for you to sit down and relax. You can easily take a moment to enjoy the outdoors and the beauty of your yard by this faux fountain. Landscaping glass is a great way to create the feel of flowing water. There are many variations of blue hues that will create an interesting combination and show the many colors you would see in water. The Bahama Blend has a mixture of lighter blues and darker blues that make us think of days on the beach with flowing waves. This design gives a pop of color to your existing rock bed. Use a few pots to and fill them with landscaping glass. Make sure one of these pots is tipped over so it looks like your landscaping glass is flowing from it. This design is close to a pool. It gives a playful feel of the landscaping glass flowing into the pool to fill it up like a stream into a lake. It is always hard to make your flower bed or plant bed look clean and neat. Most of these areas have areas of bare dirt that bring no color or design to your landscape. Depending on the type of plants you have in the area you may have large areas of this bare dirt. Instead of allowing this to stop your landscape from being bright and colorful add landscaping glass. Fill the top of your area with landscaping glass of any color. It is best if there is a defined ridge to hold the landscaping glass in place. It create a neat edge and will help your yard feel more modern. This design chose to go the natural route. The Aqua landscaping glass creates the beautiful look of flowing water. The plants look as if they are suspended in the flowing stream. This type of design is great for a boarder to a sidewalk or along a patio. Even if you are not using plants you can still create a colorful border with landscape glass on the side of your sidewalk. You will enjoy walking along the bright colors that the landscaping glass comes in. Use a mixture of colors for a more custom design. Landscaping glass is great for all of your outdoor projects. You will be able to use it virtually anywhere to create a clean modern look in your yard. The landscaping glass is rounded so there will be no sharp edges to worry about. It will be easy to put the landscaping glass in and you will have no concerns of being poked during the process. Depending on where you are using the landscape glass you can choose from different colors. Go for a natural look in flower beds and use a blue, think of contrasting your colors against your decorations in the landscape, or use a color that will allow your bright flowers to pop against the background. Anywhere that seems like it is lacking a bit probably could use some color. Landscaping glass can be used in a variety of way so you can easily add this color in. You can use it around plants, in other decorations, around decorations, in your rock beds, and around your sidewalks. No matter where you put your landscaping glass you will love the way it makes your yard look. Fire glass is a great alternative to the typical fireplace fillers like logs or wood. It is more attractive and can take your backyard to the next level in terms of decoration. People are sure to be impressed by the beauty that fire glass adds to your existing fire pit. This fire glass is environmentally friendly and comes in a variety of styles so you can choose what works best for your landscaping. These styles vary in size and in color. A small fire pit on your patio can help your guests feel more at home and relaxed as you entertain. They are great to put a couple of patio chairs or small couches around. They work well for intimate gatherings or for a date night in. This octagon firepit top gives your patio a bit of flare without being too large and in the way. The table top is more neutral in color so it will be easy to match it to any patio design. It has a black base that is sleek and carries into the black border on the table top. The firepit in the middle is smaller so there is room on the table top for drinks or even a late night snack. For a simple feel this firepit has black fire glass in the middle. It gives the illusion of a more typical firepit while still being more attractive than having logs or wood expose on the table top. 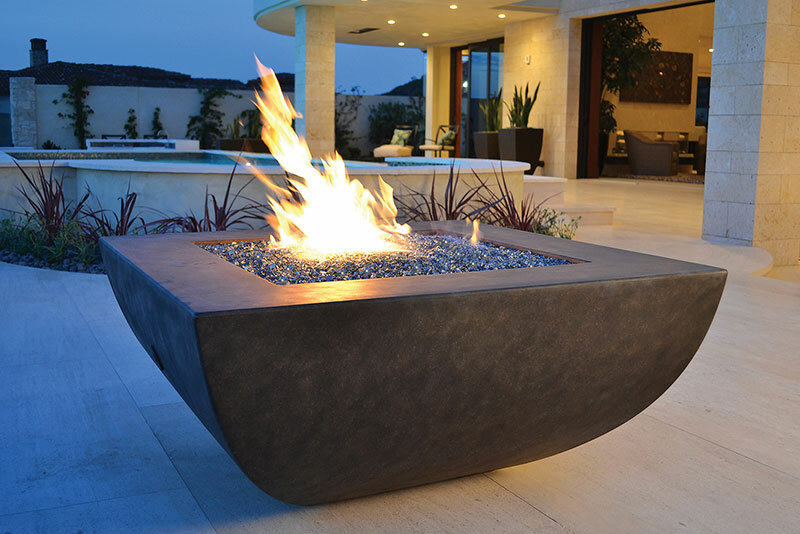 This circle firepit has a more sleek top. It gives off a more modern feel but it paired with a more natural rock on the bottom. This can be a great addition to any landscape that is keeping to the more natural size of design. It does not interrupt the flow of your landscaping and it has a beautiful and neutral coloring. 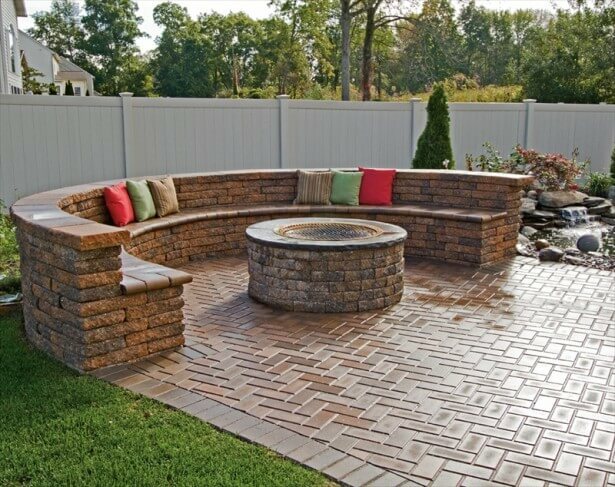 This firepit is best suited for an area that has seating surrounding the entire pit. A patio sectional is a great choice to keep people close together. It allows everyone to enjoy the firepit at all angles since it is round. To match the natural rock of the firepit there is a darker fire glass used. This amber fire glass has an earthy feel to it. It gives off a warm color that is reminiscent of a burning wood. A large firepit is great for anyone that likes to entertain. It is a great centerpiece and will be easy for people to gather around for a fun evening outdoors. Pair a large firepit with a lot of seating. Allow people to spread out so they are not so clustered and they will still be able to enjoy the fire. This firepit is more pleasing to the eye in terms of construction. It is not made of a rugged rock that is reminiscent of a rock wall. Instead the base is made from rectangle bricks that are covered by squared rock slabs to create a cohesive design. The outer rim of this firepit is smaller to allow for a larger area for the fire glass to be placed. The color of the base of this firepit is darker and pairs great with the amber fire glass. The larger size of fire glass is used to help better fill the middle of the firepit since it is a larger area. The amber fire glass is great in large quantities because it has the typical glow you expect from a warm fire. A complete change from the more subtle uses for fire glass. This firepit uses a variety of shapes and sizes of rock to give it a more do it yourself feel. It appears to be handmade with care with the square and rectangle rocks placed for the circular base. The top uses rock slabs that vary in size and shape as well. They do not fit together perfectly but are spaced evenly to create a completed firepit top. The inner circle of this firepit is filled with cobalt blue reflective fire glass. It makes for a beautiful centerpiece to any landscape. The color is surprising to anyone that has not seen fire glass before and will create an interesting talking piece for your gatherings. This is paired with bright blue cushion and a pool not far off. This firepit gives your yard with pool an even more luxurious feel. It will seem like you are at resort relaxing by the pool instead of at home entertaining. Moving away from patio firepits this large firepit is more suited for a large open area of the yard. This firepit is ideal for anyone that wants their firepit the center of attention. It is made from a smooth sleek rock that will give your yard a more modern feel. The shape of the firepit also moves away from the typical circle pit to a square one. There is a large area to cover on the inner square of the firepit. The medium black fire glass is a great choice for this firepit. It will be easier for you to fill the firepit but still give a sleek modern look to your firepit. Fire glass is a go to design choice for anyone looking to modernize their firepit. Fire glass is beautiful to look at with or without fire added into the mix. The fire glass does vary in size and shape because it is crushed to create the multiple pieces. This allows for a more unique look in your firepit. Depending on your specific need you can choose what size you want. There is small fire glass that starts at ¼ of an inch and goes up to ¾ of an inch for those larger firepits. No matter what design you have in mind you can find a color that is going to match beautifully and add a special touch to your landscape design. Aquarium pebbles are the most common aquarium substrates over all kinds of fish tank stones and sand. This is not only for decorating your fish tank, but there are sundry bio-chemical properties in gravels, that help filtrate your aquarium, and provide nutrients to the fish and other inhabitants. The right use of gravels is an important element in fish keeping. Any fish gravel will not be suitable to all animals, plants, and the type of water. Here is a guideline of using appropriate aquarium glass. Aquarium pebbles are not an absolute necessity, but they are highly recommended for the betterment of the fish and marine animals you are keeping. ing for hobby. As these animals are spending the rest of their lives away from their natural habitat, the right arrangement of aquarium substrates will at least supply them some essential minerals and biochemical that keep the organisms healthy and help them live longer. While the aesthetes of your aquarium is entirely a personal choice, creating the appropriate habitat for your aquatic animals is specific to biological needs of the organisms and their reception to the environment you have created for them. The size, color and the build of the aquarium pebbles applies in making or disturbing a comfortable and sustainable fish habitat under an aquarium. For the betterment of your fish, it is best to have some live plants and microorganisms and infusoria in your aquarium, and the pebbles should be complying with the plants and microorganisms too. The more accurate and comfortable the fish habitat you can create, the healthier and longer your fish will live. There are some fundamental factors for choosing appropriate aquarium gravel, the most important factor is to judge by the water of your aquarium whether it is fresh water or salt water. Subsequently, ensure that the type of water is in adherence with the salinity tolerance and natural habitat of your aquatic animals, unless they are euryhaline. There are many saltwater and freshwater variants of certain species, like stingray. Aquarium Gravel is a substantial choice of substrate for both salt water and freshwater aquariums that plays a pivotal role in nitrogen cycle, and help filtrate ammonia build up, work up as a substantial soil to flourish aquatic plants that can purify and promote oxygen and essential minerals in the water. The difference of water has different chemical reactions to certain gravel like hardness of water and pH buffer. Freshwater aquariums are the most common choice of fish keeping for hobby. There is a wider availability of freshwater fish, which can even be found on small, local pet shops, fish like, goldfish, angelfish and guppies. Whether you want to create a community tank, or raise a single species, you are going to need the appropriate freshwater aquarium pebbles to create a proper habitat for your freshwater aquatic animals. Freshwater aquarium gravel come in a variety of size and colors and reactivity to freshwater. You can choose between hobby glass, aquarium pebbles, sand gravels, crushed coral, and many more materials. It is best to choose blunt edged gravel over pointy and coarse ones, to ensure better safety for your aquatic pets. Freshwater aquariums are easier to find than saltwater gravels. Saltwater aquarium gravel on the other hand, have fewer varieties in comparison to freshwater tank fish stones. Marine animals usually have very specific biological requirements and are more expensive to maintain. The choices include aragonite, shell and calcium based gravels. You are limited to use the neon pinks and green options regarding color, as hobby glass, aquarium pebbles and colored aquarium stones cannot be dyed, therefore cannot be used in saltwater tanks. Research is the best resort to find out the specific needs of the kind of fish or any other aquatic animal that you are having, in order to create the most sustainable home for them. Natural colored aquarium gravel is the most common choice for fish hobbyists, while few others have a penchant for fluorescent and neon color aquarium pebbles, or fish tank stones, that are apparently unnatural looking, and something that the fish has never seen in their natural habitat. However, that is usually not going to make a huge difference, as many freshwater fish either cannot distinguish, or are very adaptable to funky bold or bright colored aquarium gravel and will be happy as long as they have a gravel bed to dig and have clean water, with sufficient food and oxygen supply. However, some fish can indeed be stressed out with the bold and bright colored aquarium gravel and their light reflection. Many aquarists have noticed that the variations of colored aquarium stones affects the color of the fish’s skin, and even a shorter life span than usual. So this doesn’t happen yo your fish tank, we suggest using the jade General people can hardly tell by looking whether their fish is stressed or happy. If you prefer neon and bright colored aquarium gravel, that are presumably unnatural, then ensure to take care of the maintenance of your colored aquarium gravel and fish. As it comes to size, the choice is between large, small, and fine colored aquarium gravel. Large particles allow a greater range of sedimentation of biological wastes and leftover food particles to pass through its gaps. This can lead to toxin build up and have the potential of inflicting infection and disease in the aquatic animals and create an unsafe environment, thus also require frequent cleaning. However, as one of the pros, large colored aquarium gravels can offer a substantial scope of protection for the fish eggs and fry, as it falls under the gravel gaps and stay out of reach of the adult fish that like to eat them. It works the same way for infusoria, so there is ample chance for eggs and fry to flourish under large colored aquarium gravel. Small size aquarium pebbles are the most substantial choice for accommodating most of the fish’s natural behavior, like digging, burrowing, or scooping. However, fine particles like sand gravels can cause irritations to the fish as well as cleaned up with the waste materials through a vacuum and thus soon reduce in quantity needing replacement. It can also clog the supply of sufficient oxygen, for having little gaps and being compact in nature. The lack of oxygen can cause the build up of hydrogen sulphide, which is a highly toxic chemical for the fish, and lead to infectious disease and even death. Hence, as a fish hobbyist, it is very important to do ample research before mixing and matching your colored aquarium gravel. Bulk Aquarium Gravel: How much do I need? When you have decided on the size, color, and nature of the fish tank rocks as the appropriate for your aquarium, it is time to determine if you should buy bulk aquarium gravel. The easiest proportion of aquarium substrate goes for an approximate 1 ½ “ to 2” in depth for the best benefit of the aquarium inhabitants. However, since aquarium sizes, shapes vary so much, this cannot be an accurate measurement. The amount of bulk aquarium gravel depends on the size and shape of your fish tank as well as the optimum depth of the substrate bed that is best for the aquarium set up you are going to have. The amount of substrate also depends on whether you are having a fish only aquarium or have live plants, or live rocks in there as well. If you have live plants, having just fish tank rocks will not suffice, you are going to need some nutritional substrate dust to support the root system and allow sufficient nutrients for the plants to flourish. Ideally, consider about 1lbs of aquarium pebbles per gallon of water. Ideally adjust the amount as per the size of the fish tank rocks, compared to their weight and build. Once you know how big your fish tank is, you can make an educated mathematical prediction if you need to buy bulk aquarium gravel or just a few bags. Fish Tank Rocks play a pivotal role in flourishing certain beneficial bacteria, that colonizes in your aquarium and help filtrate the waste particles, leftover food, plant debris etc. Other than the gravel, there may not be a more comfortable environment. The aquarium pebbles bed provides as the next best thing to a natural habitat for these bacteria and it may not grow in sufficient quantities in other substrates. Fish tank rocks not only supports for the wellbeing of animals in a fish tank, it is also needed to nurture the live plants that are equally essential to create a natural habitat, mainly for supplying oxygen and allowing an ambush for the fish to play around. There are certain live plants that grow nicely on all kinds of fish tank rocks, but some have specified needs, especially marine or saltwater plants. Either way, ensure that the plants you choose for your fish tank is suitable for its inhabitants and are well rooted to the gravel base. Whether you are having saltwater fish or freshwater fish, the choice of appropriate fish gravel has a lot to do with natural behavior and orientation of your fish. Even though you have taken care of all the size, color, material, and chemical reactivity compliance of your fish tank stones, it is recommended that you research about the species of animals you have kept. Quality of life is equally applicable for aquatic animals as humans, and it is not always about the chemicals compounds, psychological wellbeing is equally important. Fish behavior, includes hiding in the substrate, digging and scooping the substrate, and scavenging the substrate. All kinds of fish are receptive to fish gravel, and do sundry activities surrounding them. Consider blunt edged aquarium pebbles, for safety from scratching. Try to stick to similar behavioral species, when raising a fish community. If one species flourishes in an environment with large fish tank rocks and other is most suitable for fine-grained fish gravel, then you are likely to experience some large-scale compromise that can even shorten the life span of your animals. Fish that like to scavenge the water floor; can find it hard to reach out to the leftover food through large sized and heavy weight gravels, on the other hand fine particles like sand can get lodged in their mouth and cause irritation while sifting. So the size suitability has got a lot to do with the fish behavior. Live plants have are another element in your aquarium that caters to the well being of the aquarium inhabitants. Especially, for playful and highly active fish, you are going to need some live plants. Hobby glass, marbles, Plastic toys are fun thing to look at, but only for the people, and plastic does not release any oxygen, so live plants are always a fairer option for fish keeping. While the aquarium pebbles can be an ample support to hold the delicate roots, these plants need a whole lot of nutrients to thrive. To sustain the live plants you are going to need some nutritional dust substrate. Hence, you should have 2 layers of substrates in your aquarium, with proportionate portions of a nutrient enriched dust at the bottom layer, and then overlay the larger and heavier fish gravel to protect the dust from a total washout while the vacuuming. Large aquatic animals will also produce a larger amount of waste, that makes the cleaning and maintaining your aquarium a big task. Hobby glass marbles, or pebbles are easy to clean while small aquarium gravels and sand can be very problematic, especially since they get stuck to the vacuum. Before you buy fish tank rocks as per the behavior of your fish, also ensure that they adhere to your convenience of cleaning and maintaining them. Since fish tank gravel works as a filter for aquariums, it tends to accumulate waste and debris, that requires a religious weekly cleanup, along with the water change. The best tool to clean aquarium pebbles is a gravel vacuum. You will get a wide variety of size and features in these vacuums, including detachable extenders that can reach out to difficult areas, corners and even below the gravel and between the plants. And you need not relocate your fish. Select a fish tank gravel that is proportional to the size of your aquarium and to the amount of open space in your tank. If your tank is densely planted or heavily decorated, you may need a gravel vacuum with a narrow mouth to avoid disturbing plants and decorations while cleaning the substrate. If you have a great deal of open space in your tank it will definitely save you a lot of time. To clean the fish tank gravel , you can use aquarium siphons, or flexible plastic pipes. The later is best for smaller tanks. Learn how to properly siphon off the dirty water. Always make sure to use a bucket to collect the siphoning water, and place it right below the water level to save from messy spill. Create the vacuum effect to clean your aquarium pebbles, by first burying one end of the siphon or pipe deep into the tank gravel, and let out all the air inside the tube. Now, lock the mouth of the siphon and take out of the aquarium, to drain out the dirty water, and wastes along with it. Repeat the process by submerging the siphon at various areas of the gravel. You can also a Python vacuum system, which does not need a bucket, but you can just attach it to the faucet of your sink and it will siphon on its own. Always remember to only partially clean the fish tank gravel. Do not let the water level to decrease more than two-third from full. You don’t want to clean off all the beneficial bacteria in your fish tank. If you want to replace the aquarium gravel, it will definitely affect beneficial bacteria and micronutrients of the water. While the conflict continues on whether most beneficial bacteria resides on the gravel bed or the filter, the replacing of it certainly distresses the aquarium inhabitants. Beneficial bacteria not just colonizes in the aquarium gravel, it also builds up in the toys, plants and suspended water. However, this does not have to be that you are forbidden to remove anything from your aquarium. You can redecorate if you like. It is better to follow some guidelines to cause the least disturbance possible to the biology of your little aquatic world. It works the same way around when you first installed your aquarium. Get a blue print or plan of the entire things why you are changing the aquarium pebbles and how to replace them. Get a list of all the things and also the time you will need to complete the job. It is best to relocate your aquarium inhabitants to a temporary home, which is as comfortable for them as possible. You can get a replication of the tank, in order to reduce the impact of the invasion. The best time to change aquarium pebbles is a couple of days of later to your last filter change and tank clean up. This will allow the beneficial bacteria sometime to stabilize. Use a water test kit to test the nitrite and ammonia levels of the water, and ensure they are at a neutral level, before changing the gravel. It is better to not feed the fish a day before the gravel change, as there will be lesser wastes. Place the holding tank as close as possible to the main tank, so that the fish stays the least time out of the water during the transferring. Try to finish the job in as less time as possible to cause the fish the least stress. Rinse the new aquarium gravel beforehand, and rinse it until the water runs clear. When you are done with everything else, transfer a partial amount of the existing water in the main tank to the holding tank, followed by the hobby glass, the live plants and fish tank rocks (that you are not replacing), from the main tank and into the holding tank. The least amount of movement will help protect the beneficial bacteria. Also, using the water of the holding tank is will not need acclimation. Think wise, in ensuring that the holding tank has sufficient space to accommodate the entire contents of the main tank, and have ample room movement area for the fish. Use fishing net to transfer the aquarium inhabitants from the main tank to the holding tank, and cover the mouth, so that the fish do not flip outside the water. Next, remove the existing aquarium pebbles that you want to replace, and then vacuum any residual wastes. Turn on the filter to add sufficient treated water to the main tank, but do not fill the tank, as the water level will rise after adding the fish tank stones and other stuff. Now it is finally time to replace the new aquarium gravel to the main tank that has been kept pre rinsed and ready. Ensure the right guidelines while adding the new gravel, as per the quantity, depth, and portioning with nutrient dust and sand. Once you have successfully placed all the gravel and substrate as pre-determined, then you transfer the articles in the holding tank one by one, first goes the hobby glass, aquarium pebbles and toys one by one, and transfer the fish in the end. After you are done with all the transferring, turn the lights off for that day to reduce the stress of your fish. Half feed the fish on that day and then normally from the next day.